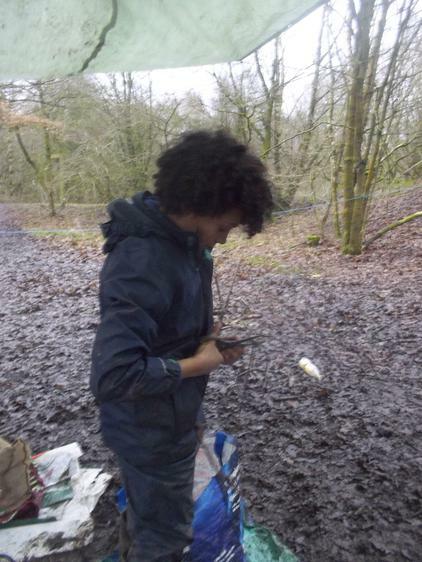 This week the photographers were away from the fire circle, so fire lighting , whittling and toasting is not captured for this website. 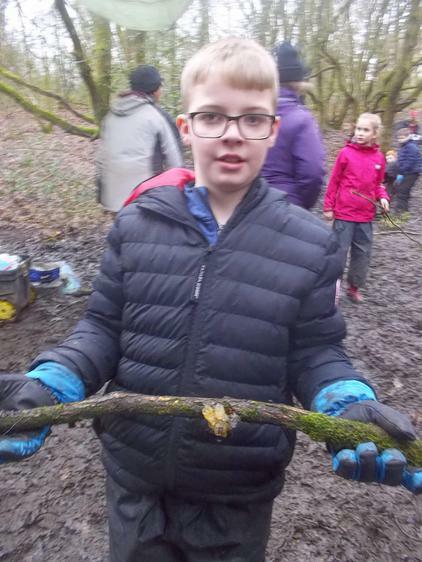 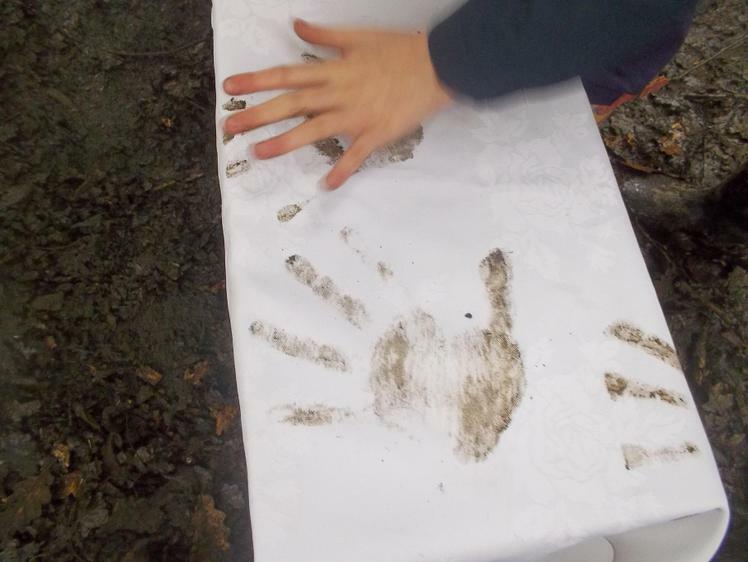 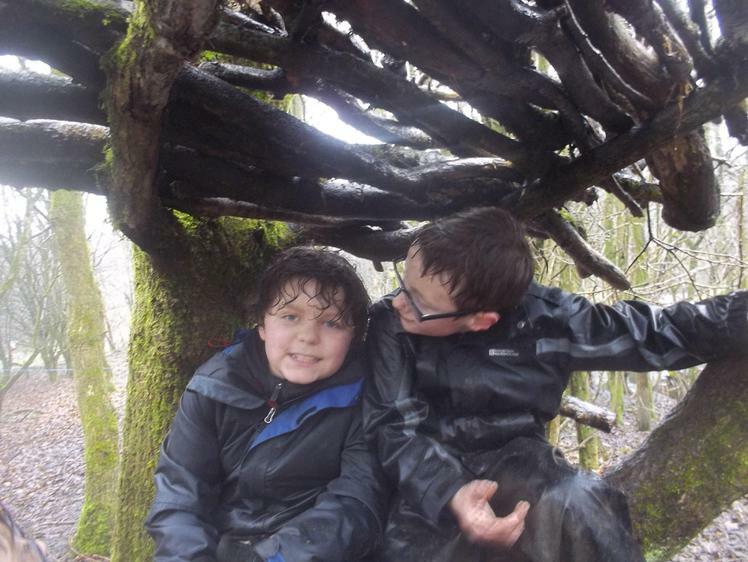 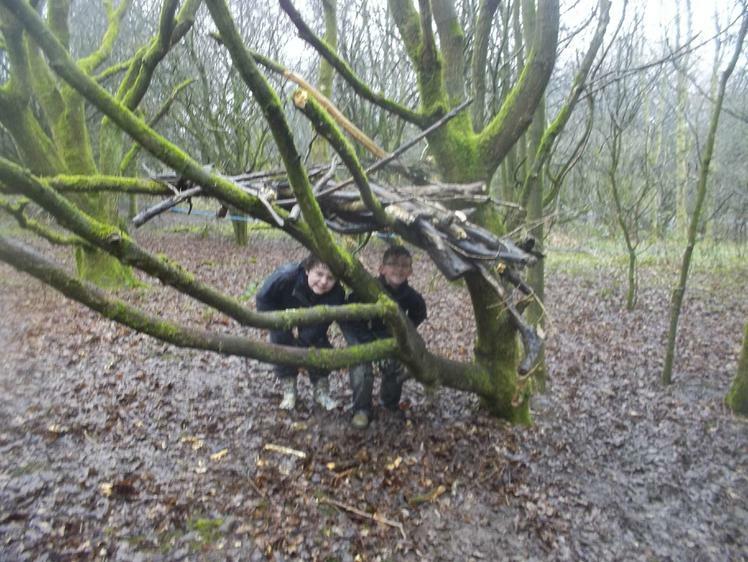 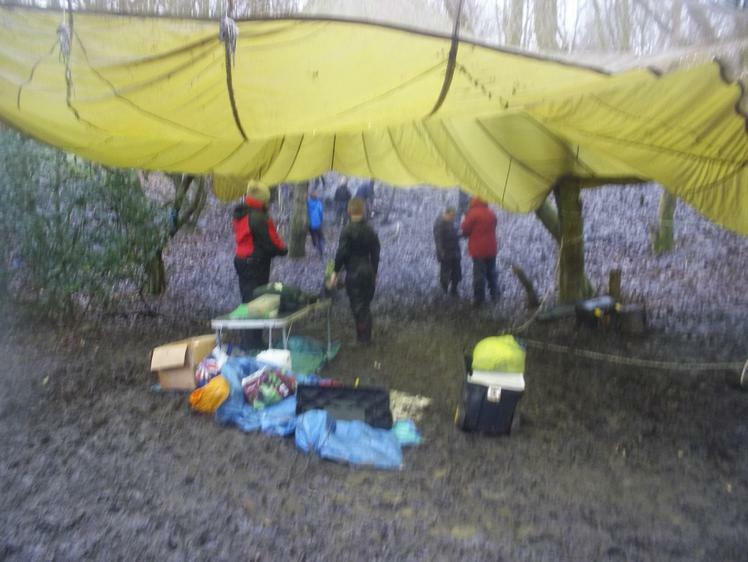 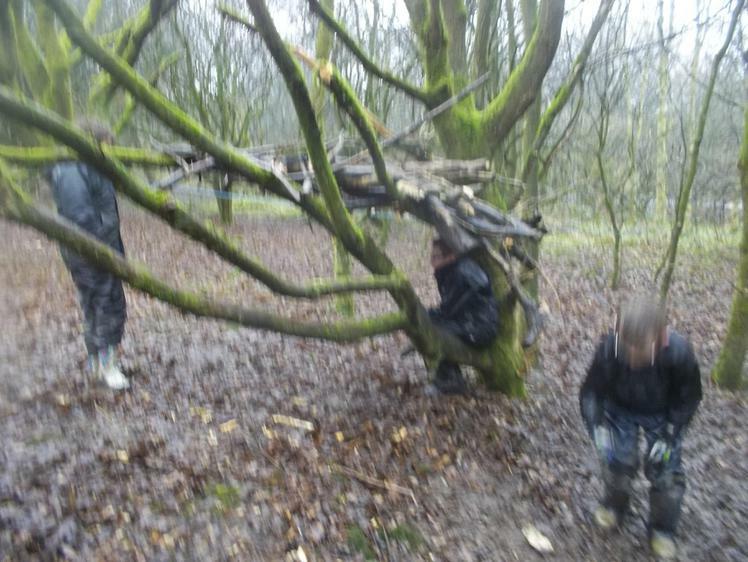 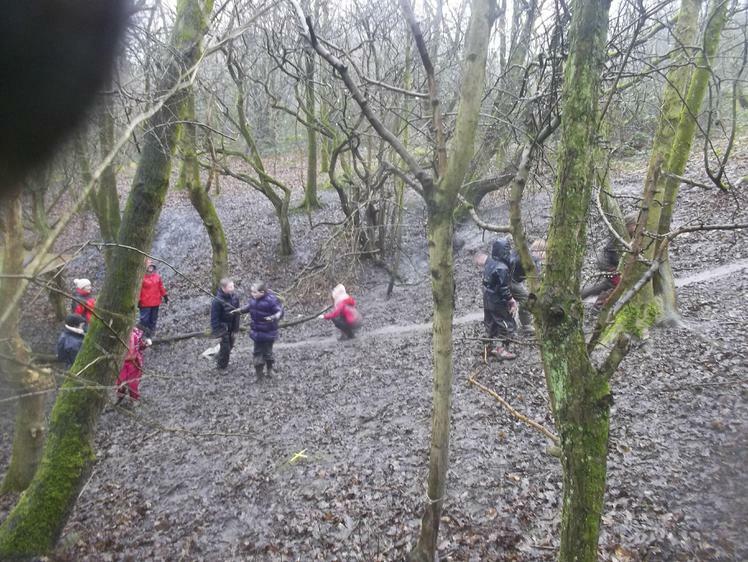 However you can see how much fun was had despite the rain-clay modelling, den building, mud sliding, hide and seek, transient art and looking for signs of spring. 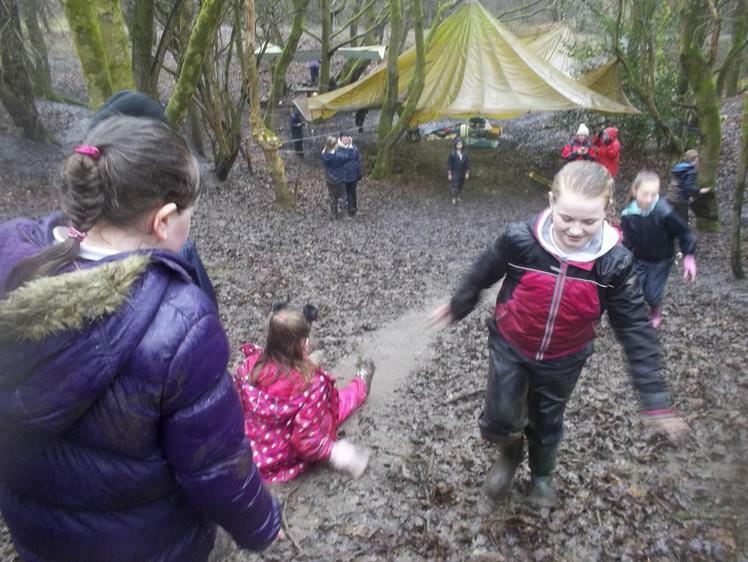 We could see the sun today! 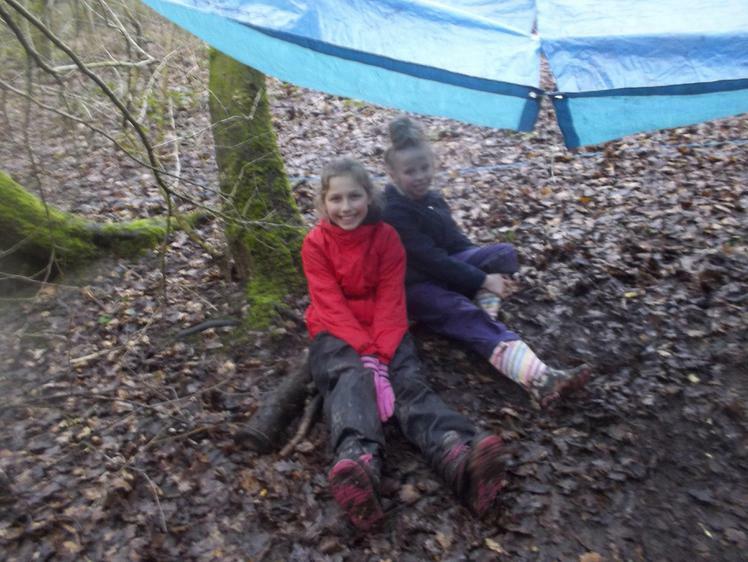 Yes, the sun shone in the blue sky, it wasn't too cold. 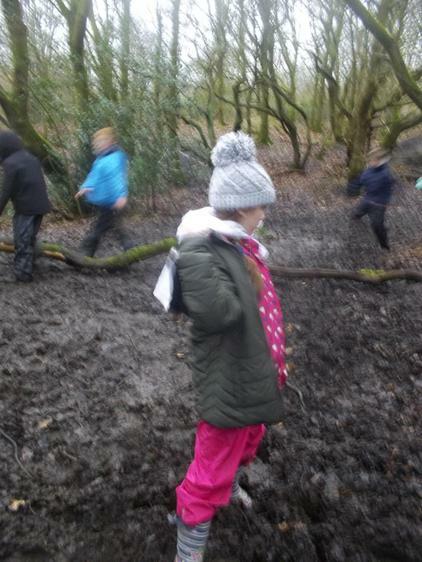 However it was really very muddy! 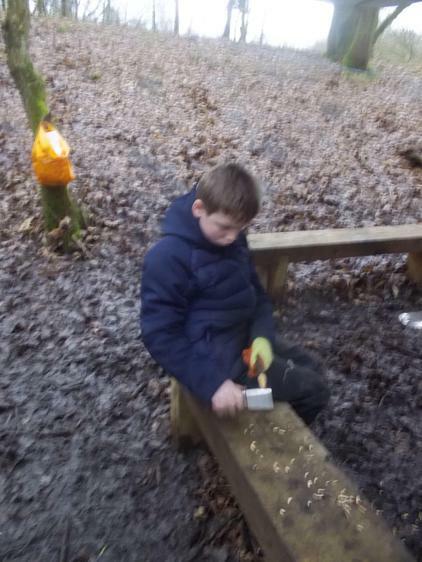 St Andrew's and St Patrick's teams were doing whittling and toasting marshmallows. 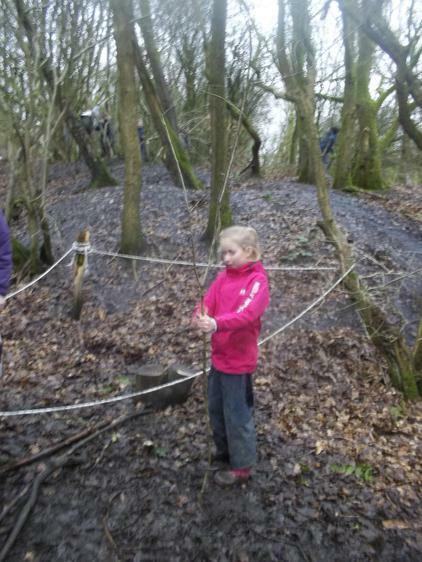 The photographer was at the fire area so all the photos are showing these activities. 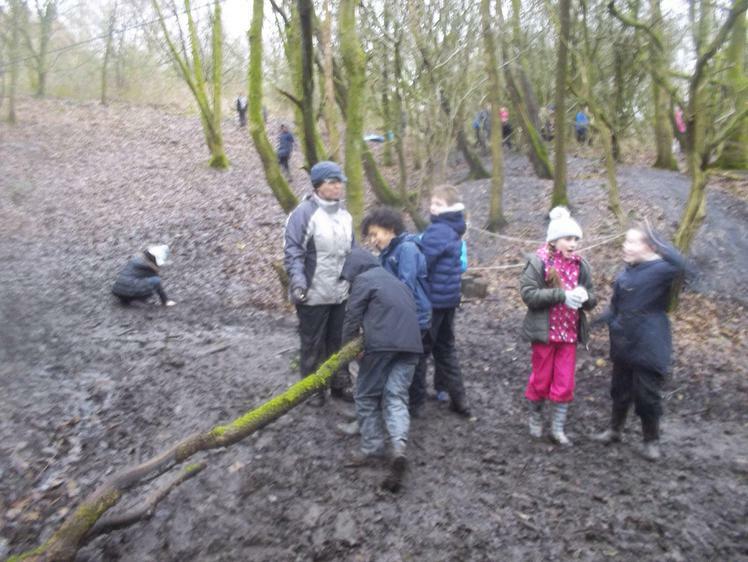 You will have to ask the rest of the class what they got up to. 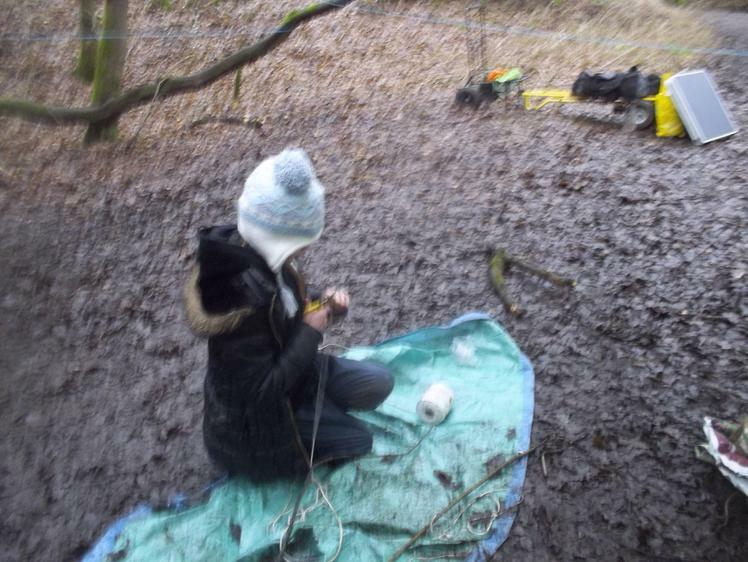 There was definitely some creative work going on though, because Katy made a clever little sculpture using found twigs and string. 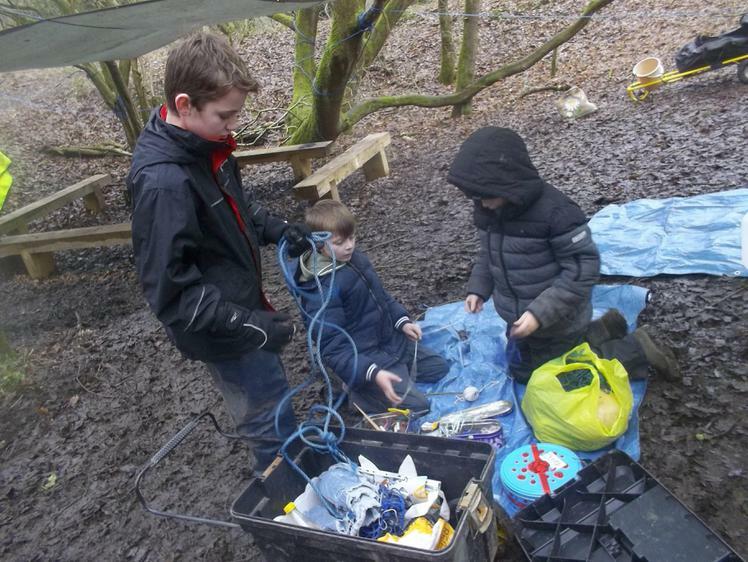 Also there was talk of a mining expedition in which findings included coal, clay and sandstone. 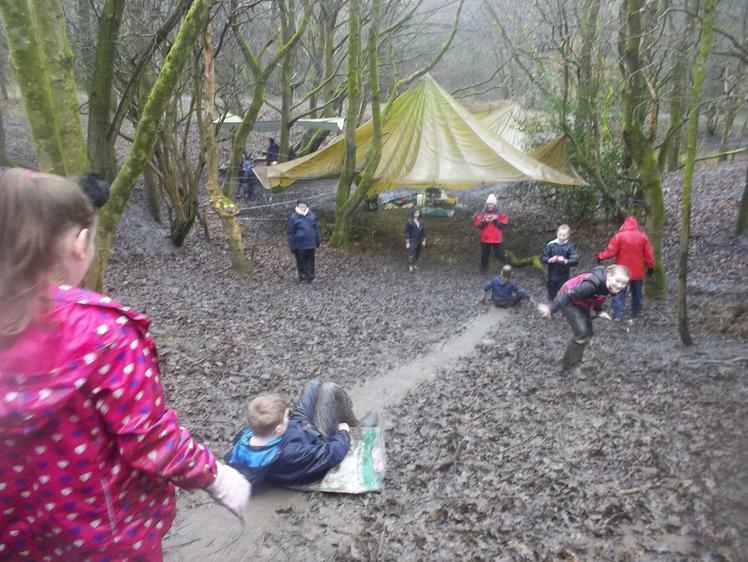 Well done St Andrew's and St Patrick's. 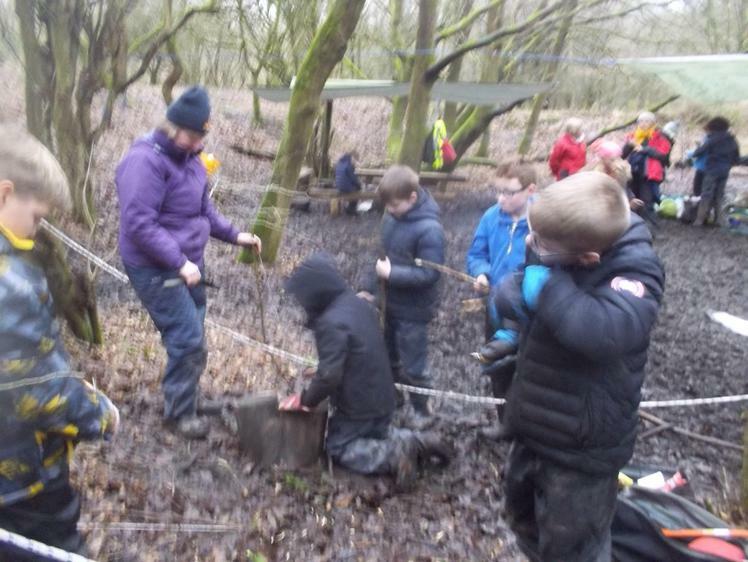 You were very safe with the pen-knives and around the fire, including during cooking. 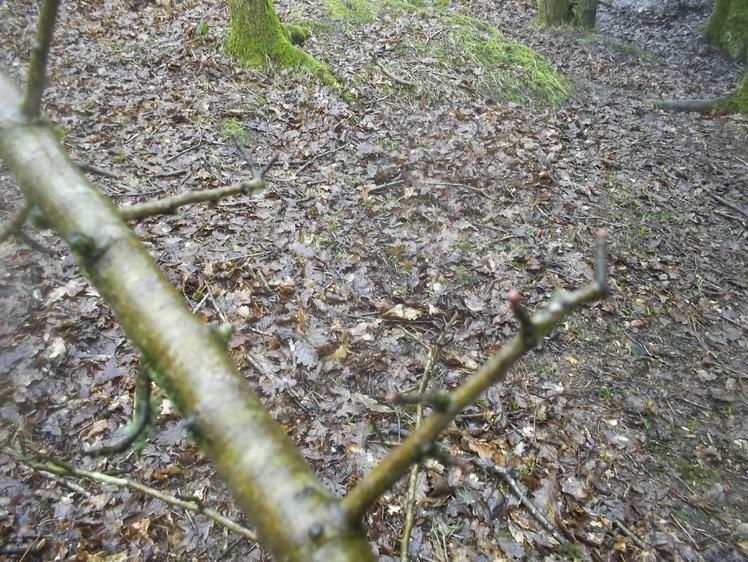 Your patience was noted. 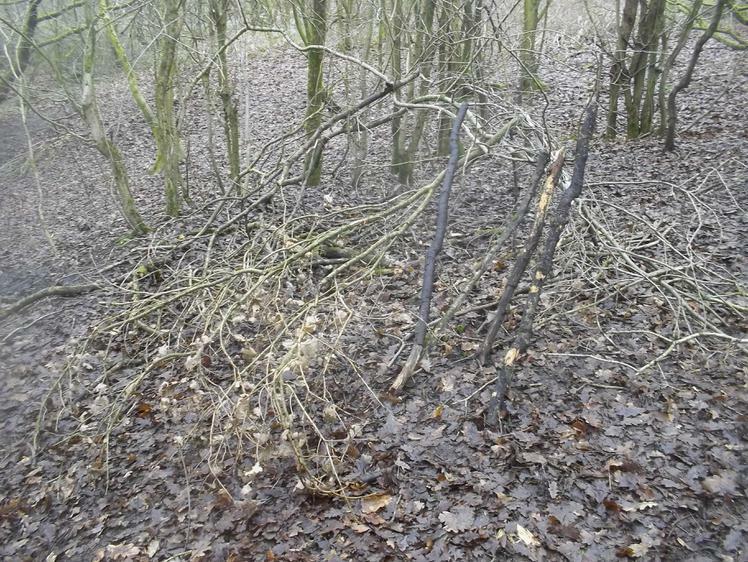 The sticks and tinder didn't seem to want to light for ages. 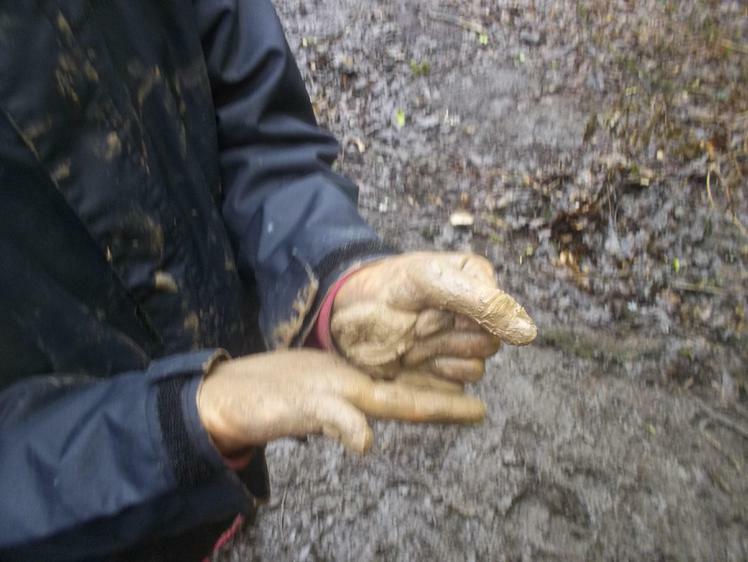 It must have been quite damp. 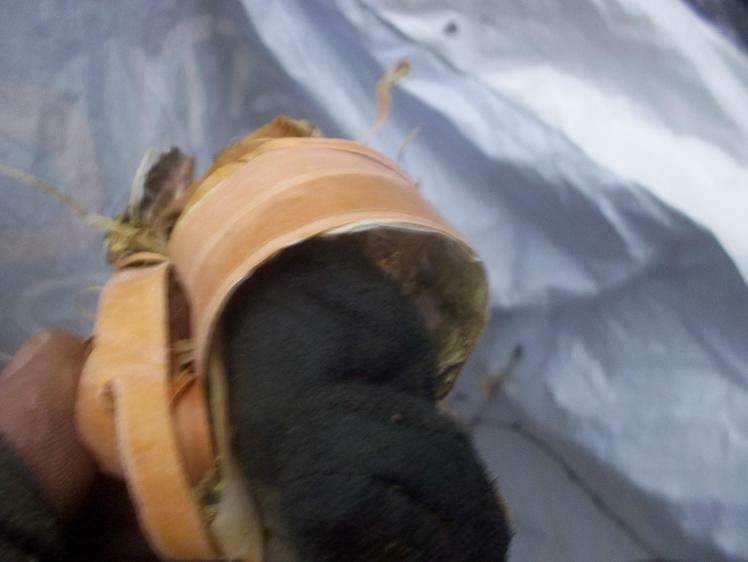 It was getting late when the flames leapt up only to turn to smoke again before everyone had had a turn cooking. 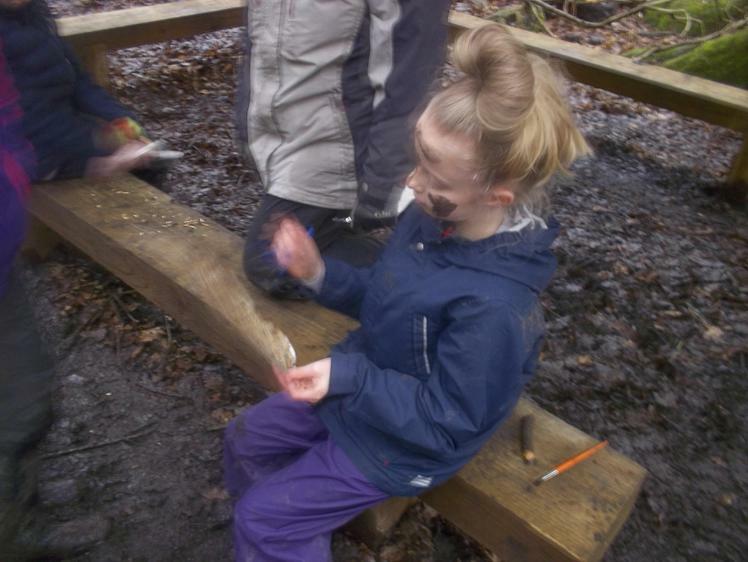 With Miss Codd's endurance, and lots of wafting, the flames returned with just enough time for everyone to complete the yummy activity before home time. 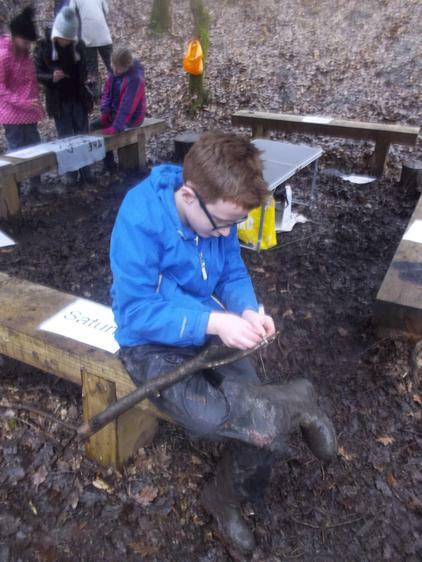 After half-term, Y5 have their last session during which, St George's and St David's will get their turn at toasting marshmallows. 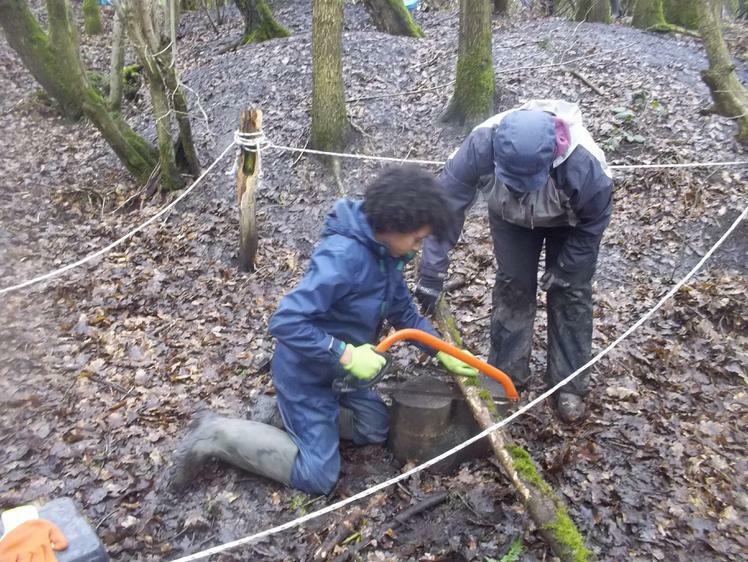 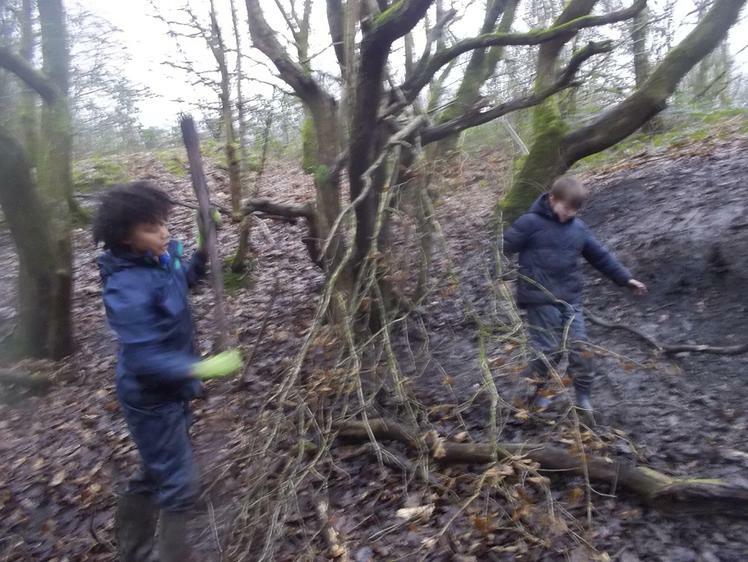 On a sad note, when Mrs McGuinness and Miss Codd arrived to set up the site, it was discovered that someone had used our tree stumps-kindly donated by Mr and Mrs Elston, and transported by Chloe, James and Michael- to build a fire, which was still smouldering! 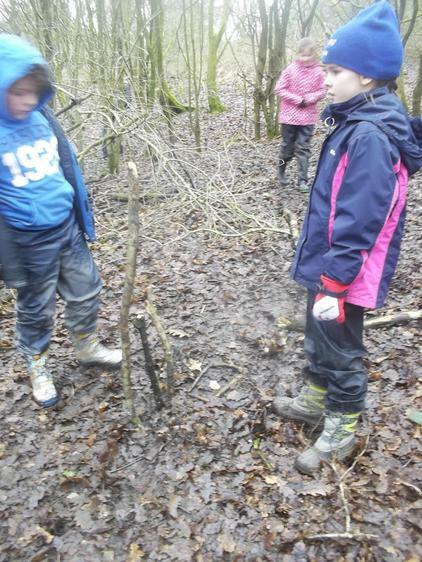 We do have some tree stumps on our school field. 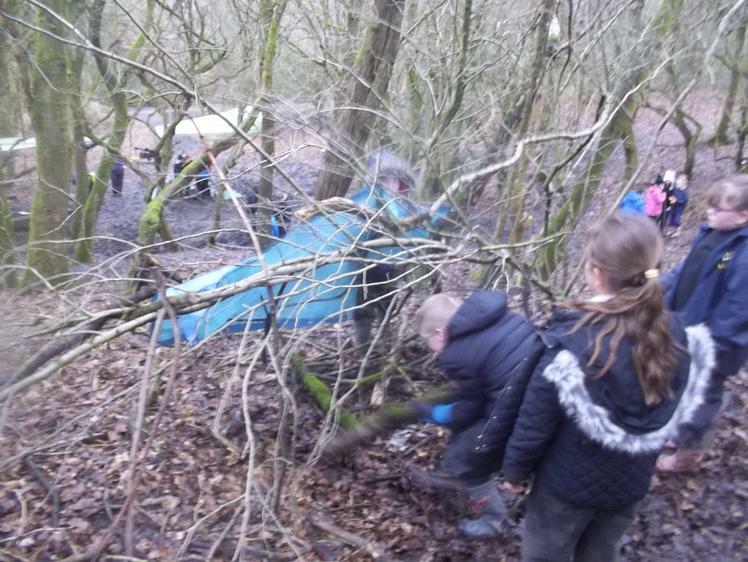 Anyone who has a wheel barrow, a truck or large trailer, and some spare time who would like to help Forest School, please contact Miss Codd to help transport spare logs to the FS site. 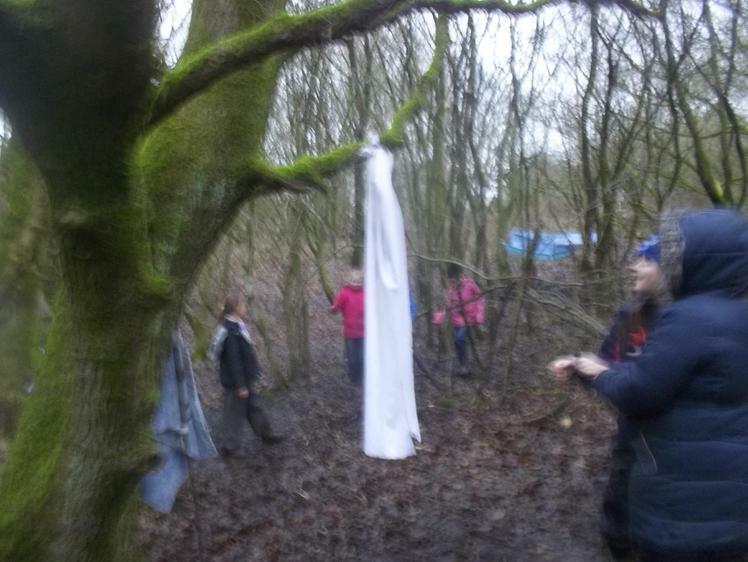 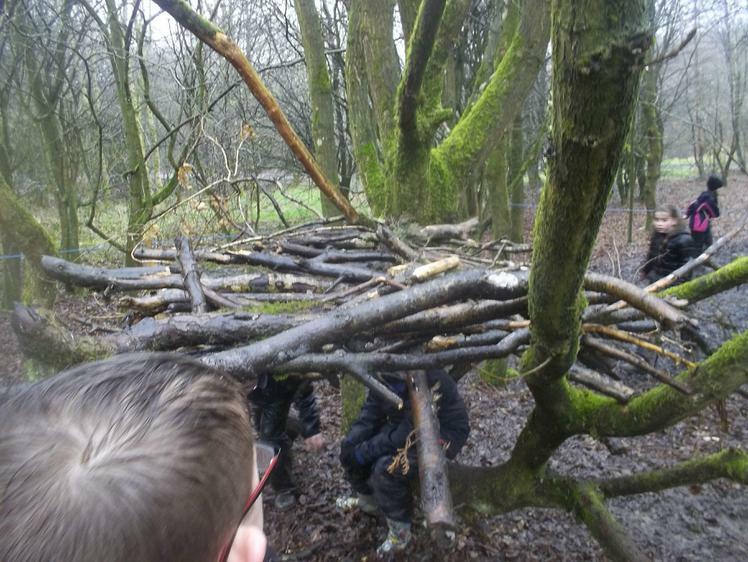 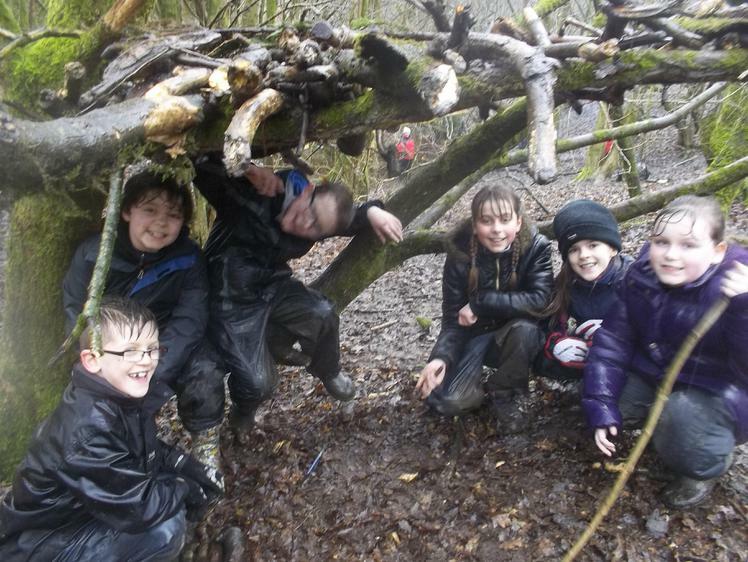 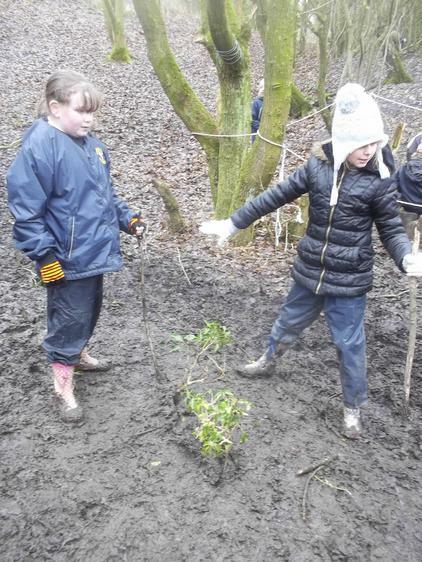 Y5 children were back at Forest School after approximately a year. 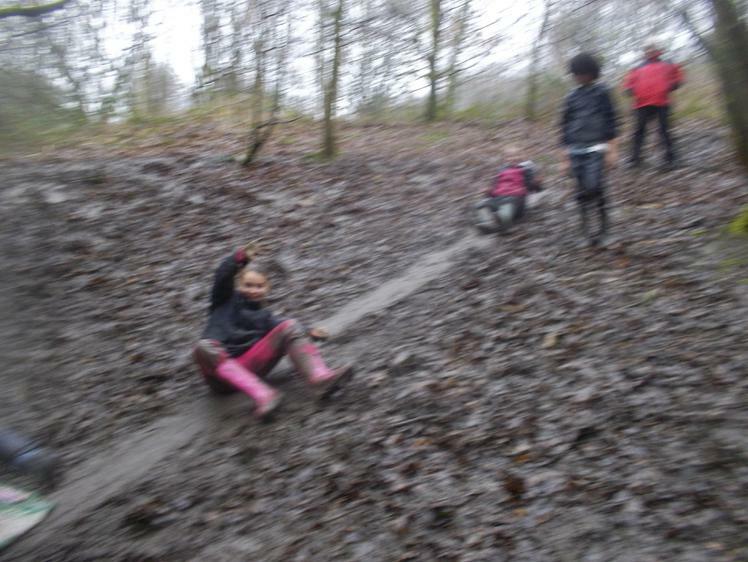 I think the photos show how much fun they had. 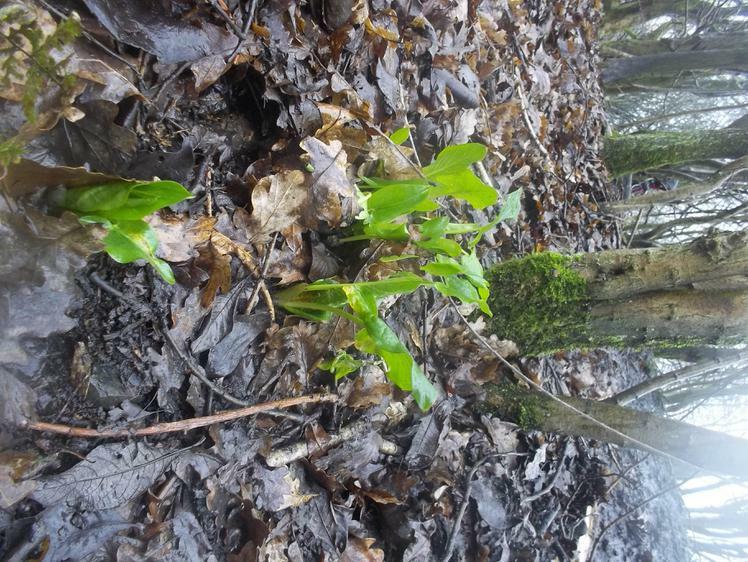 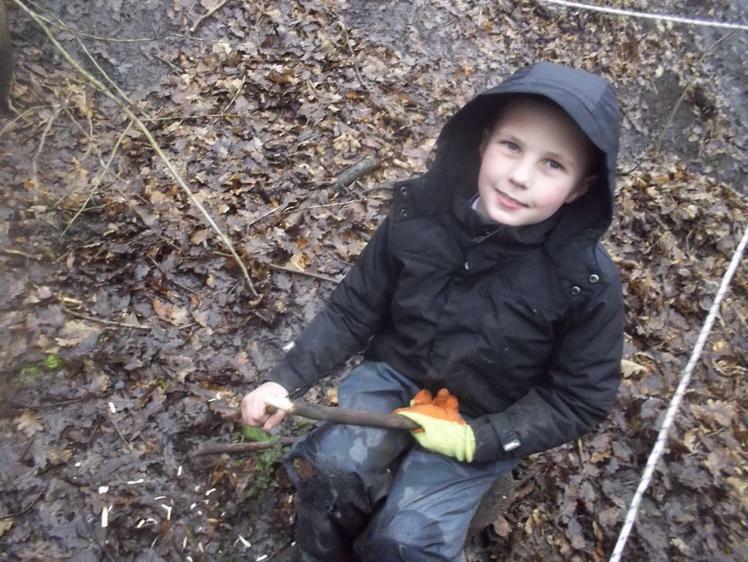 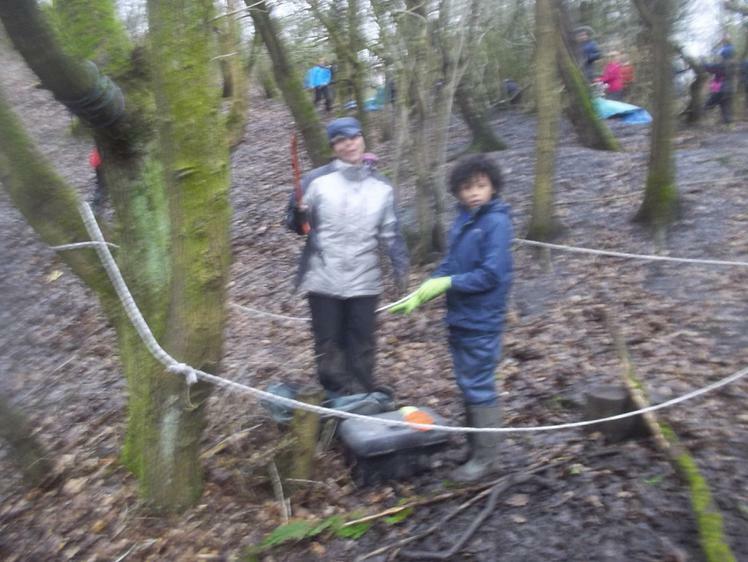 The photos for this week are on the first ForestSchoolpage. 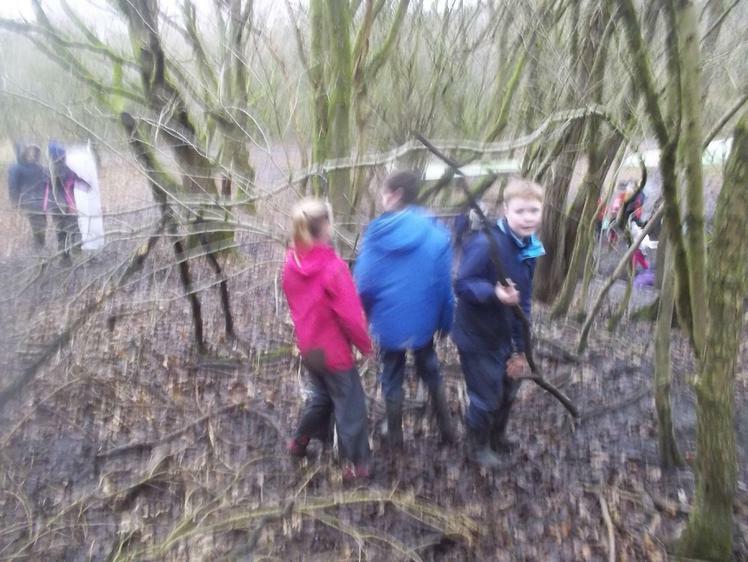 The children used teamwork to hunt the jigsaw pieces which spelled out words related to Forest School. 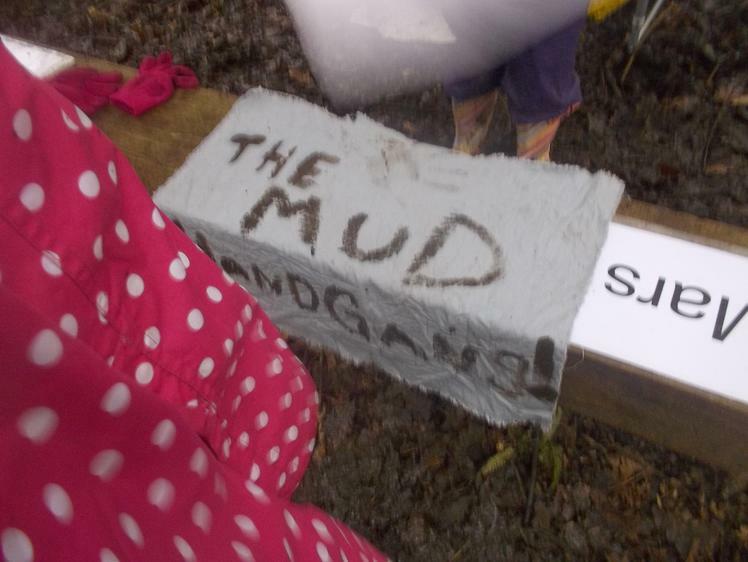 We had a discussion about their meanings. 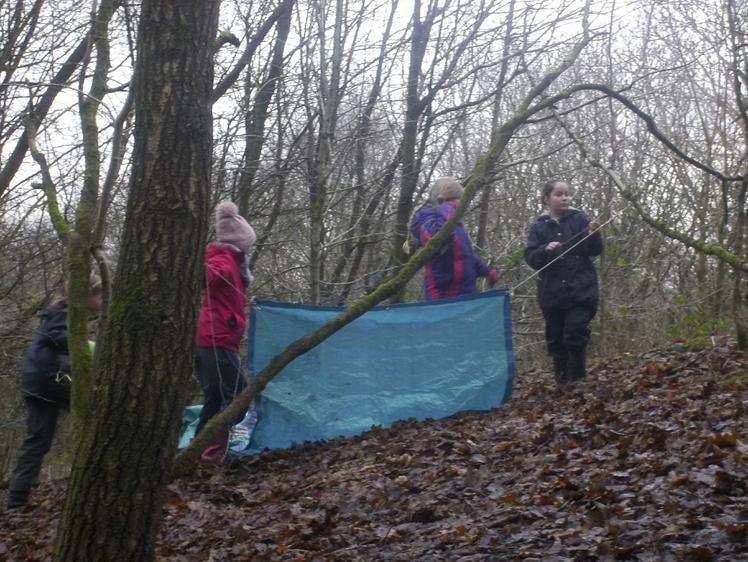 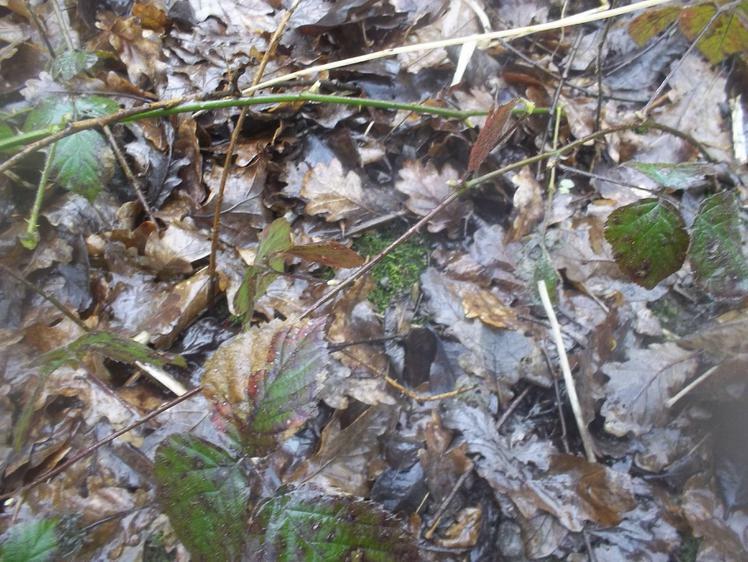 The forest school rules were considered- respect nature, do not cross the boundary and keep fingers away from mouths. 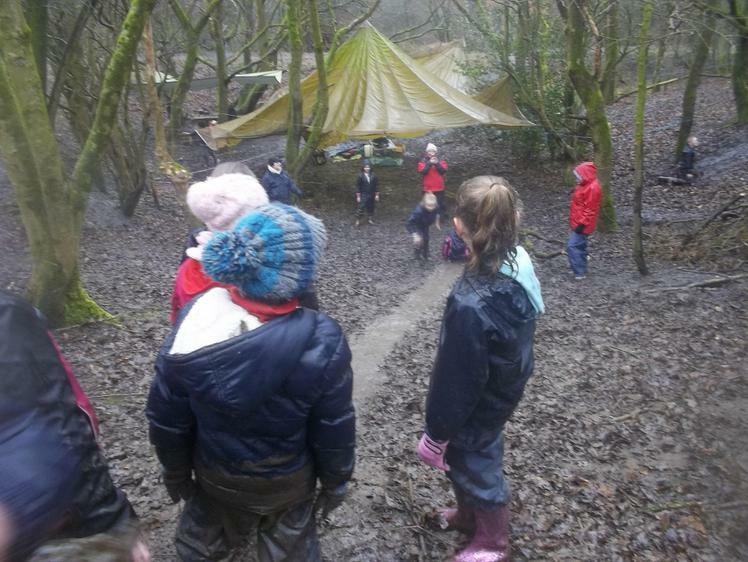 We played a safety game which demonstrates how important our voices are in an environment where we can easily be blocked from sight. 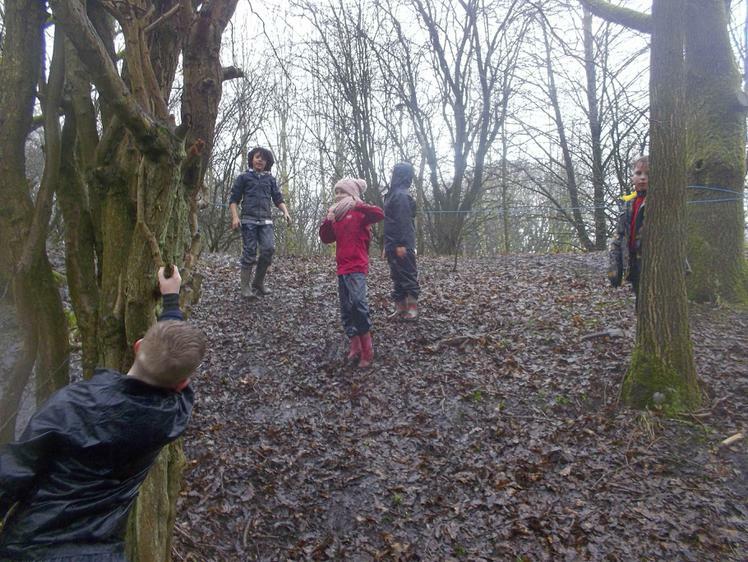 Calling to each other to keep in touch when we cannot see each other helps to keep us safe. 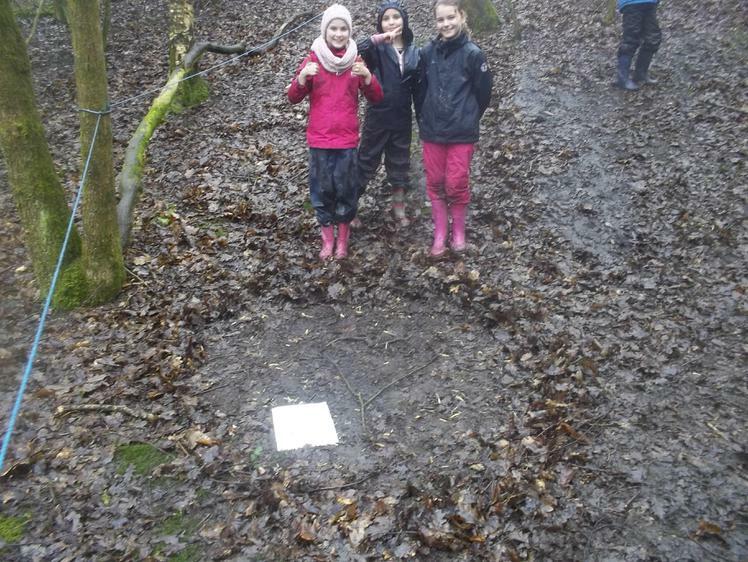 We were hoping to find and track the sun in relation to the points of the compass. 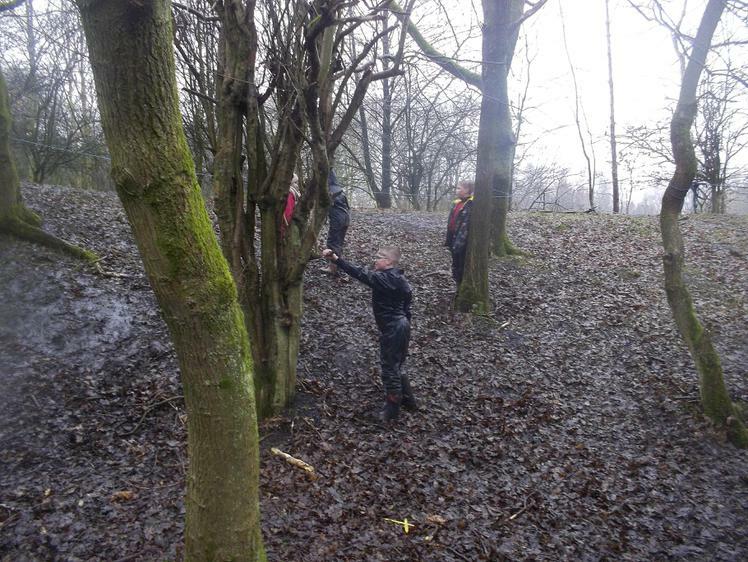 However, the clouds were so thick, we couldn't be sure where the sun was! 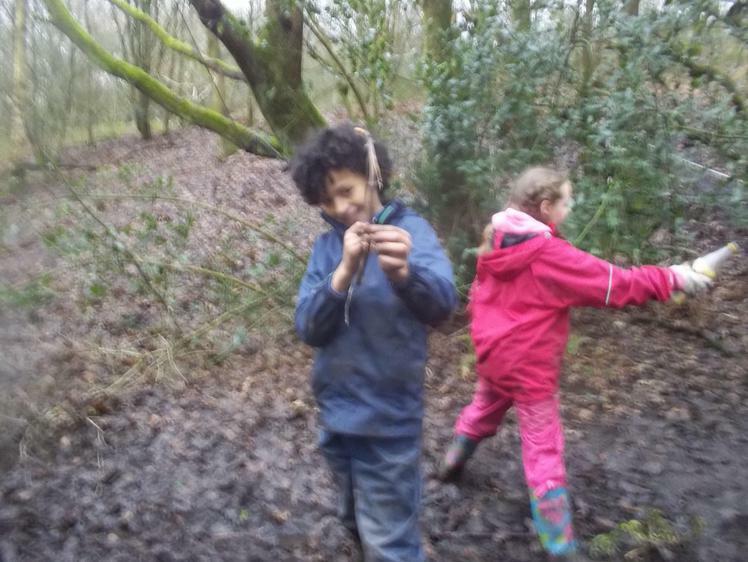 Next week the children can spend more time using compasses, and hopefully the sun will be shining then. 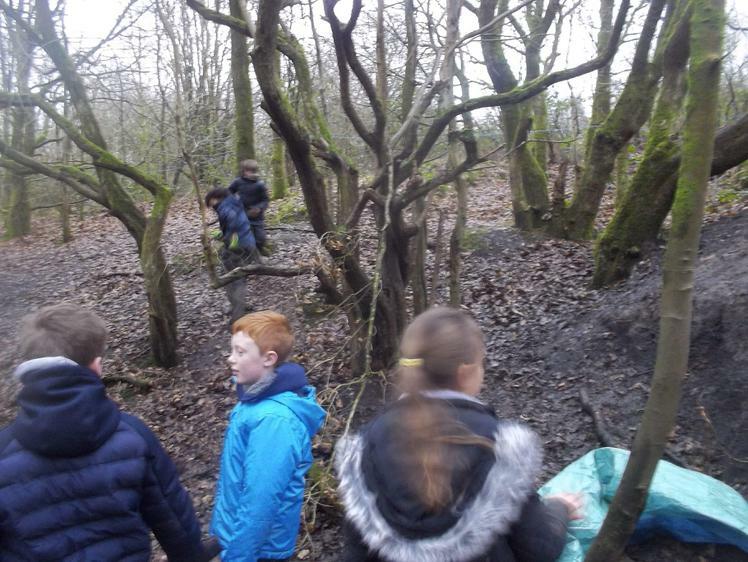 These activities will help to link the topic being covered in the rest of the curriculum, namely Space, with Forest School activities. 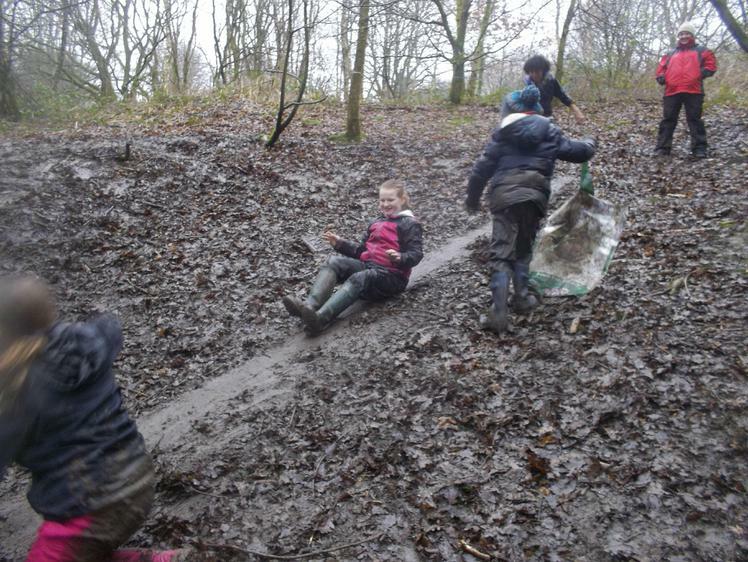 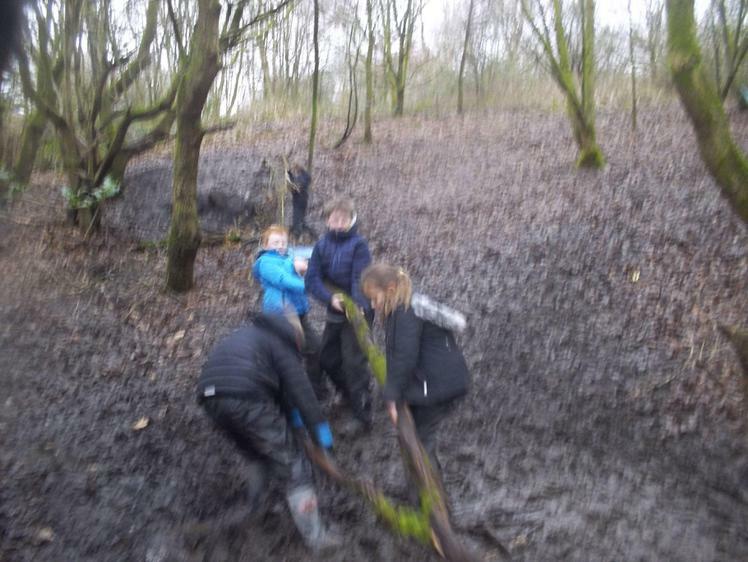 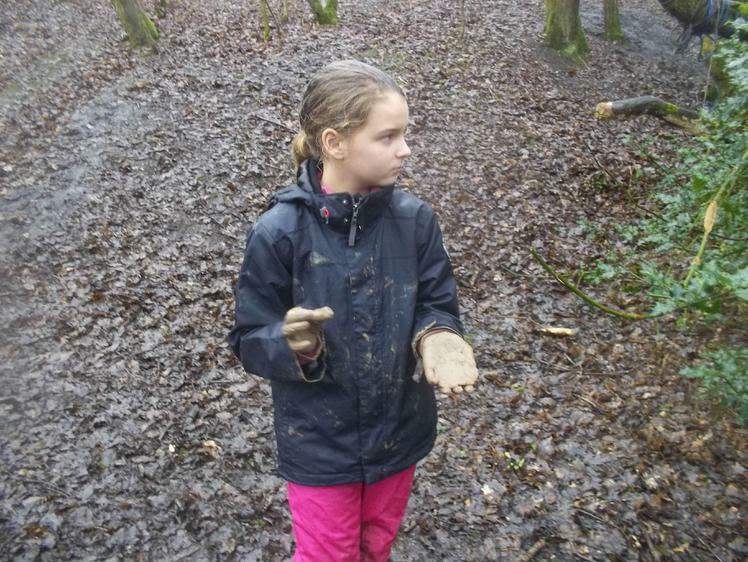 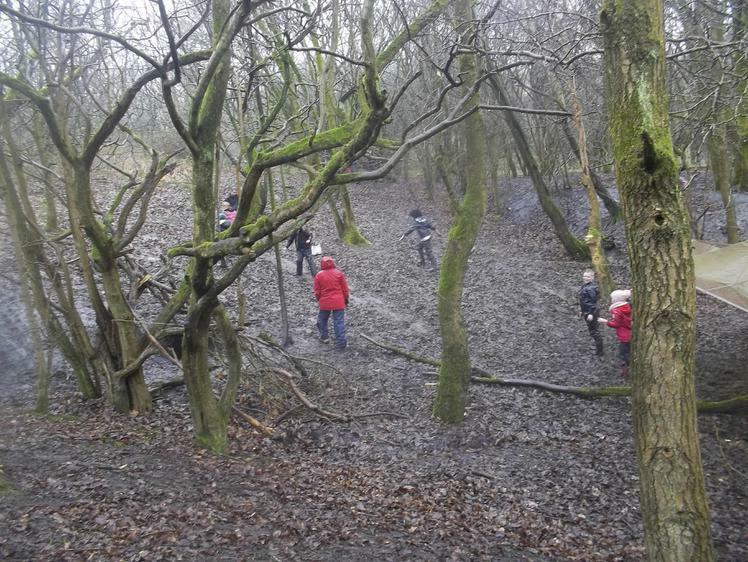 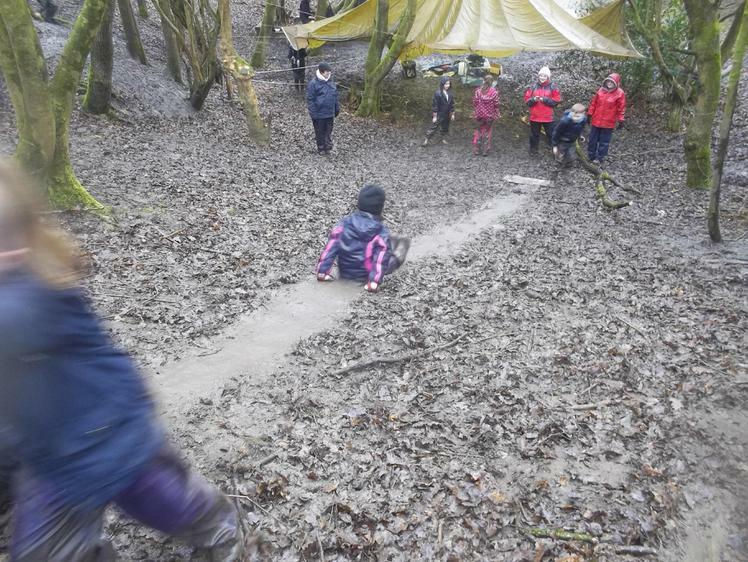 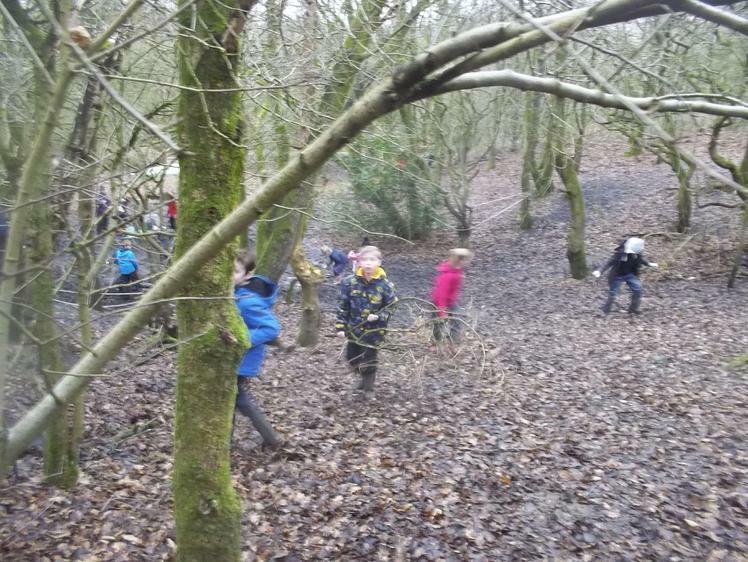 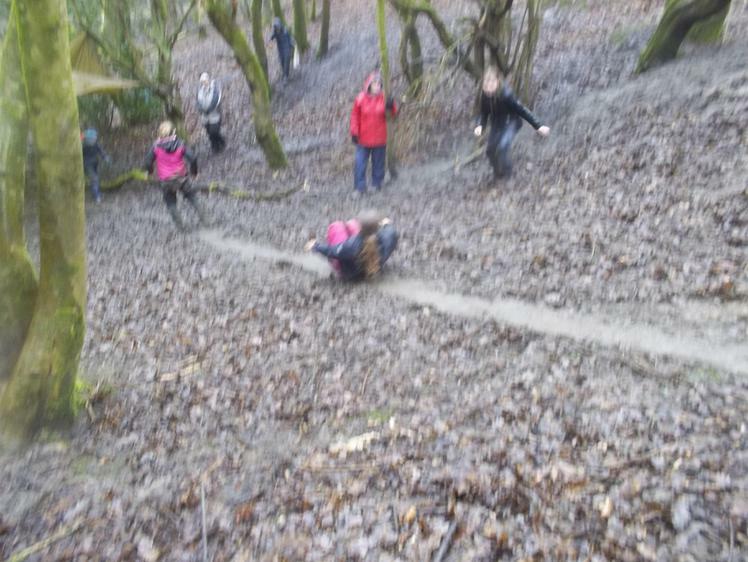 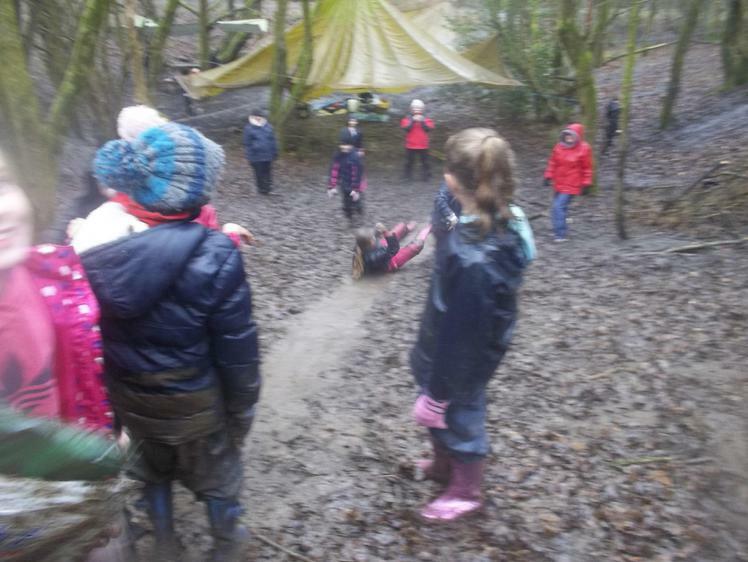 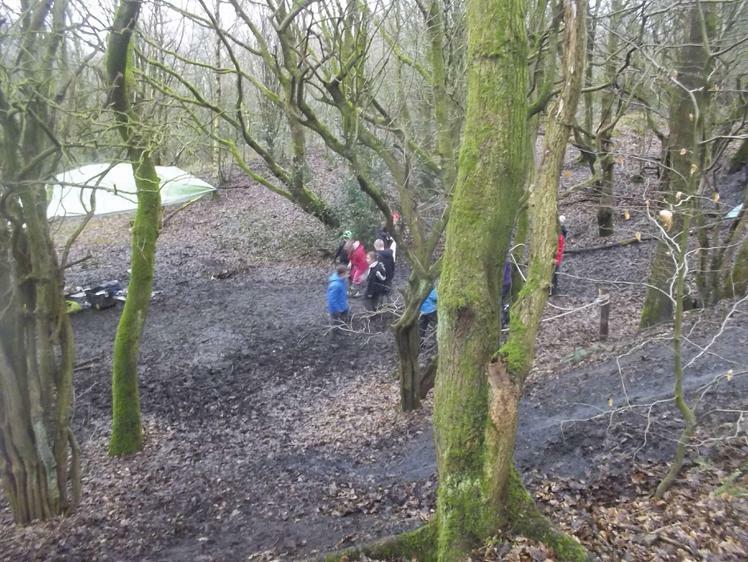 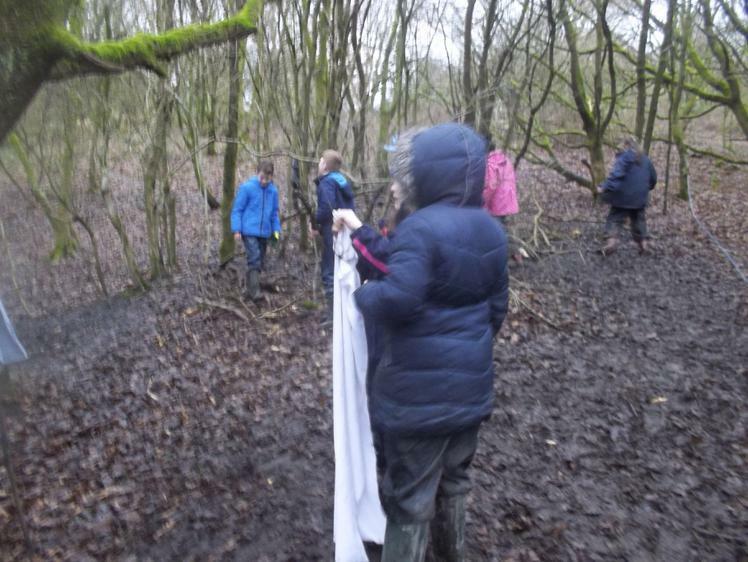 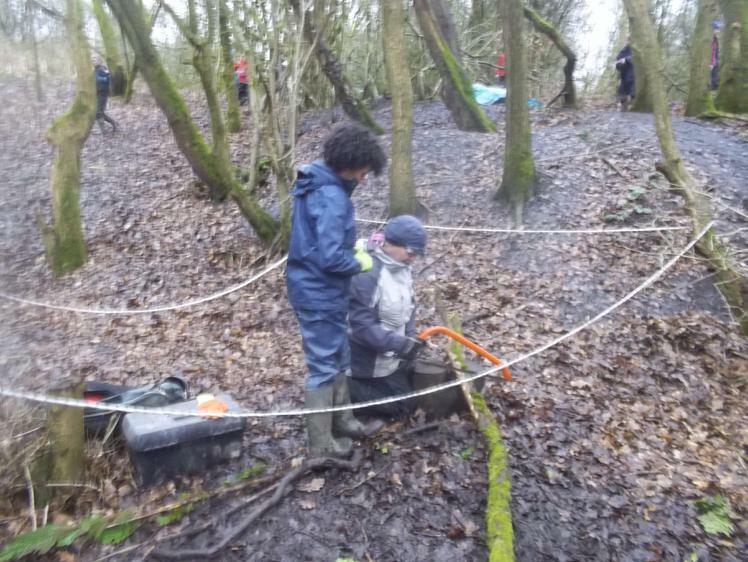 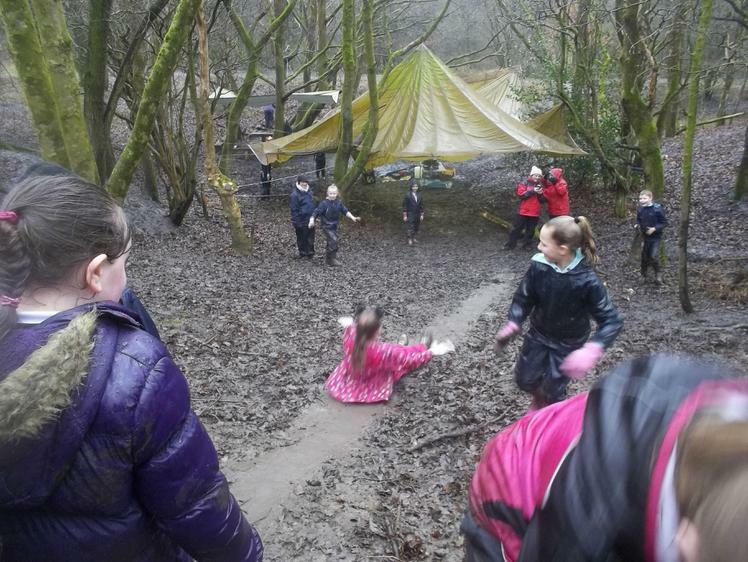 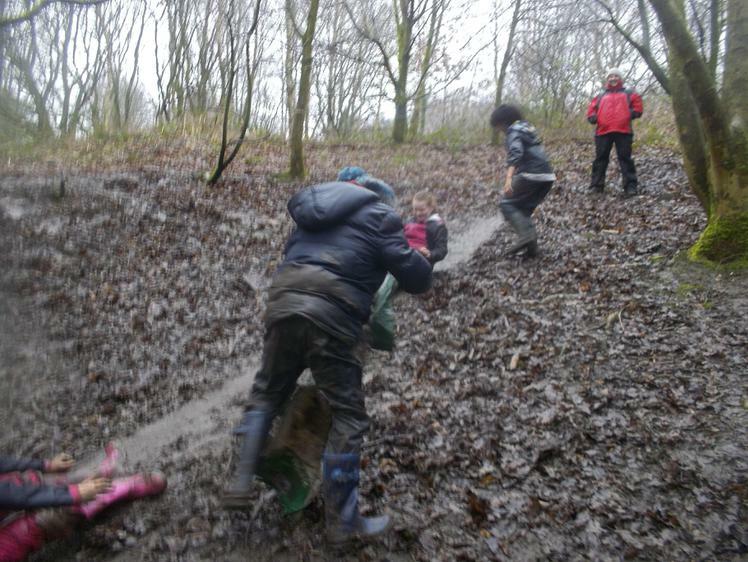 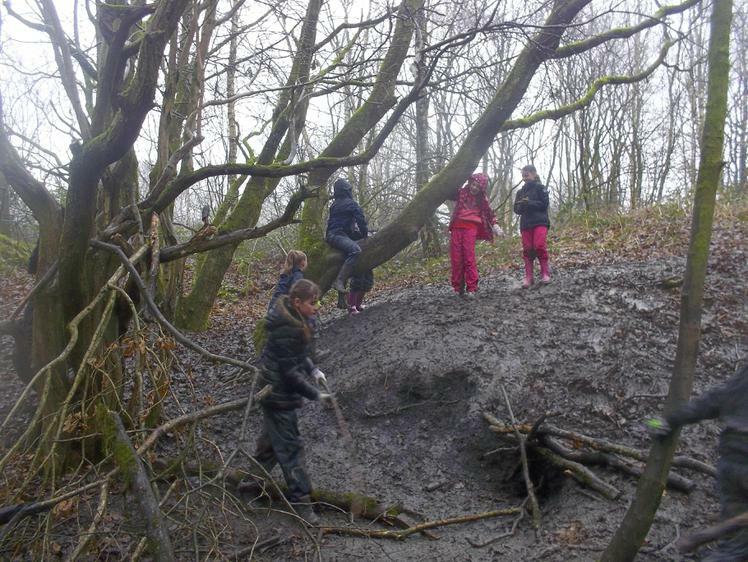 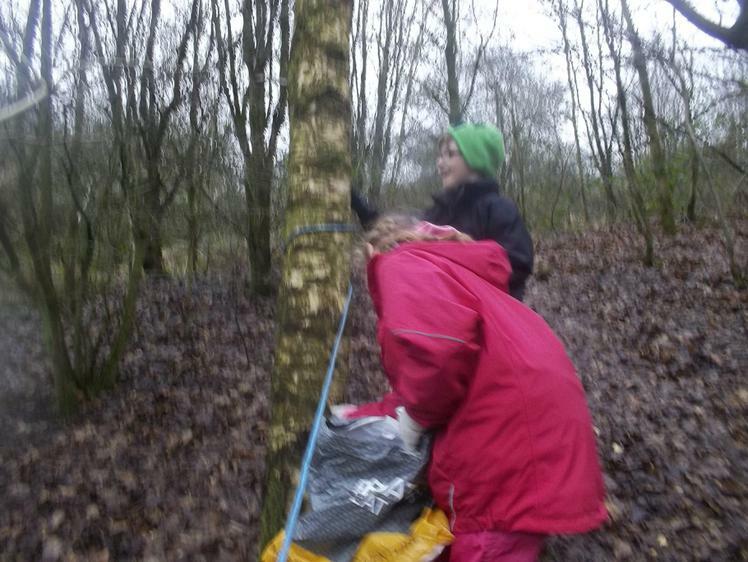 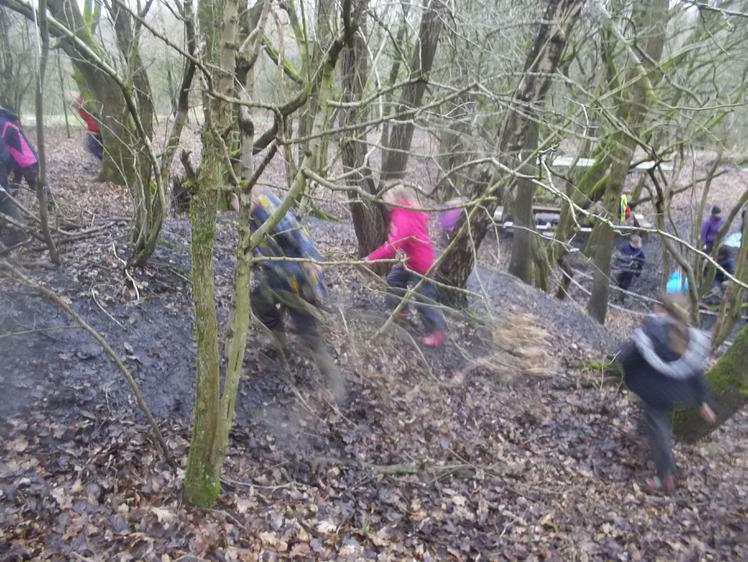 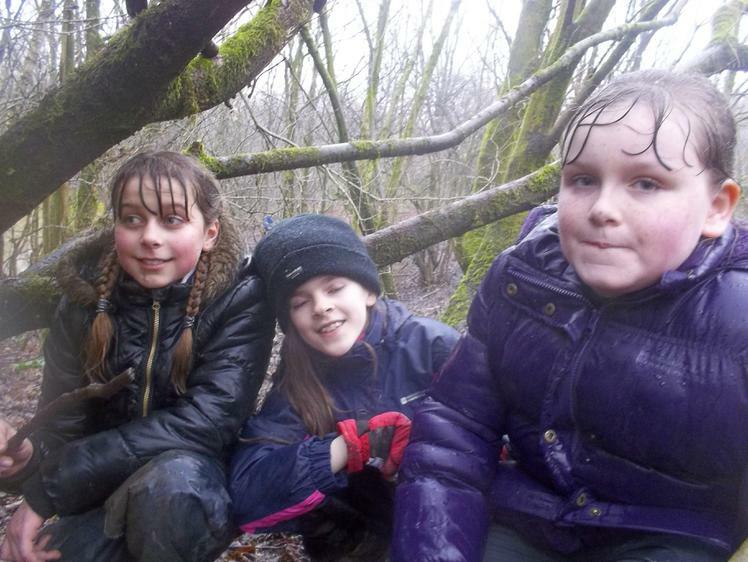 There is always something to do at Forest School and the children challenged themselves and each other to slide in the mud and run down slippery slopes. 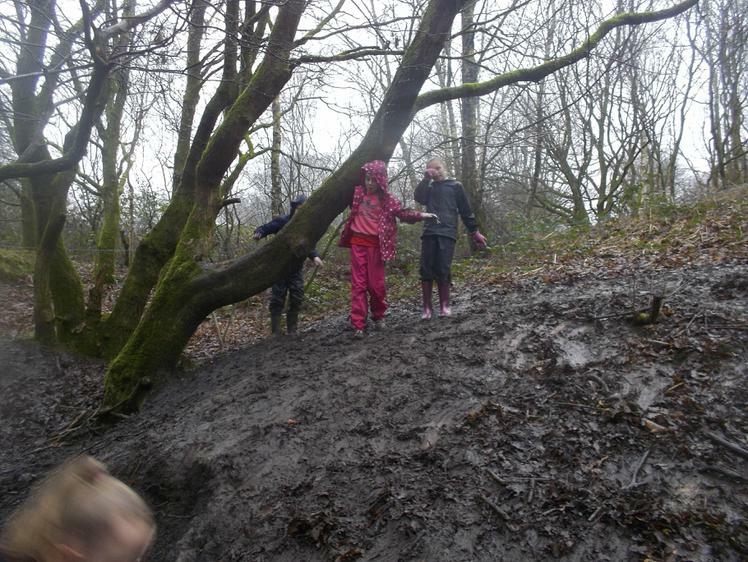 others were quite happy to explore and help each other get around the tricky terrain. 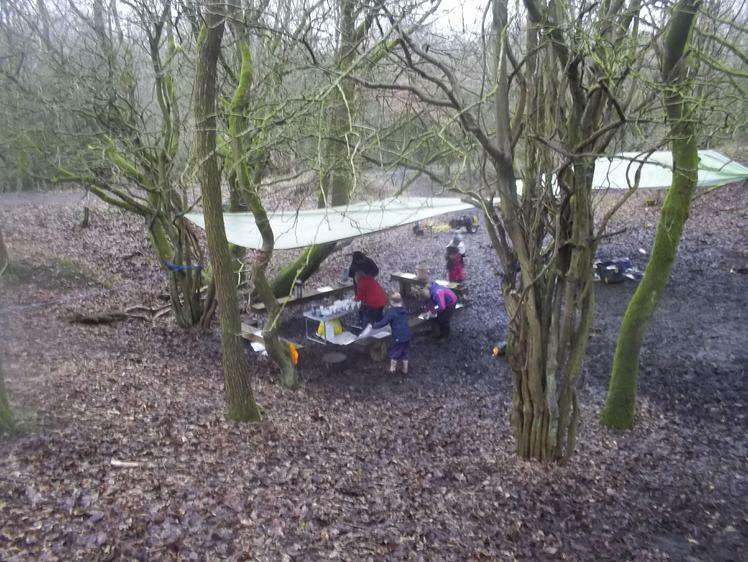 Everyone enjoyed a welcome drink. 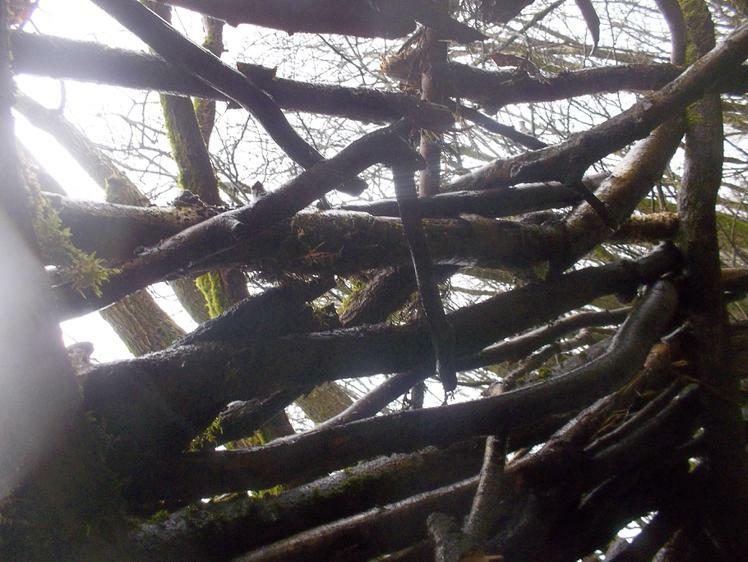 Again there were thick clouds in the sky so we could not appreciate where the sun was, to get a feel for it's daily path across the sky in winter. 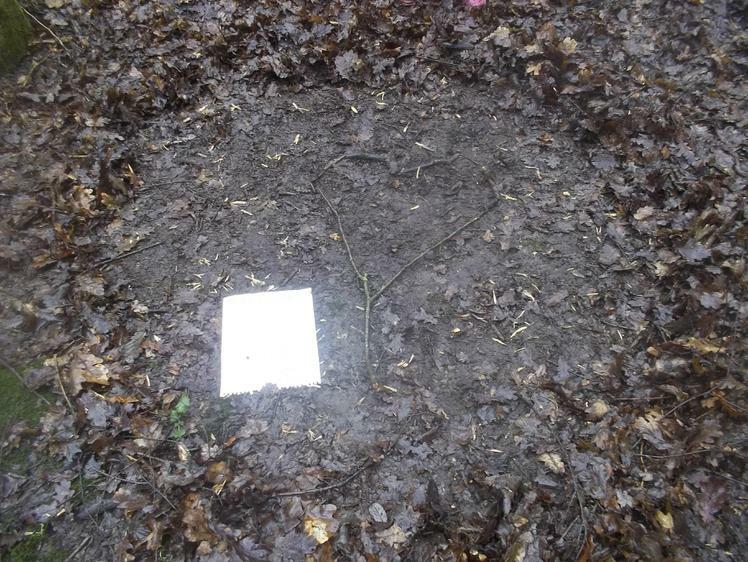 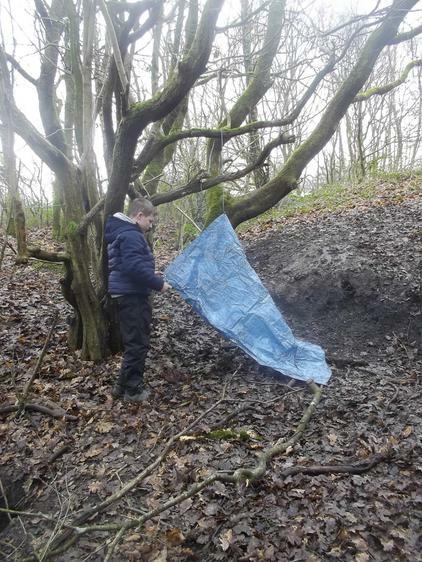 However, the children enjoyed themselves making 3d maps of the site using found objects, constructing various kinds of dens (and decorating them) and making bows and arrows to name but a few. 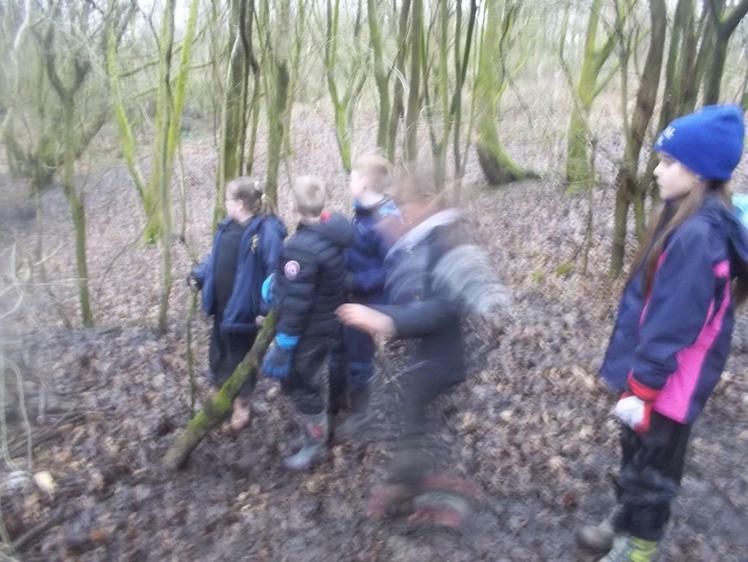 I'm not sure what has happened to all the photographs this week-maybe they are on an ipad or other camera. 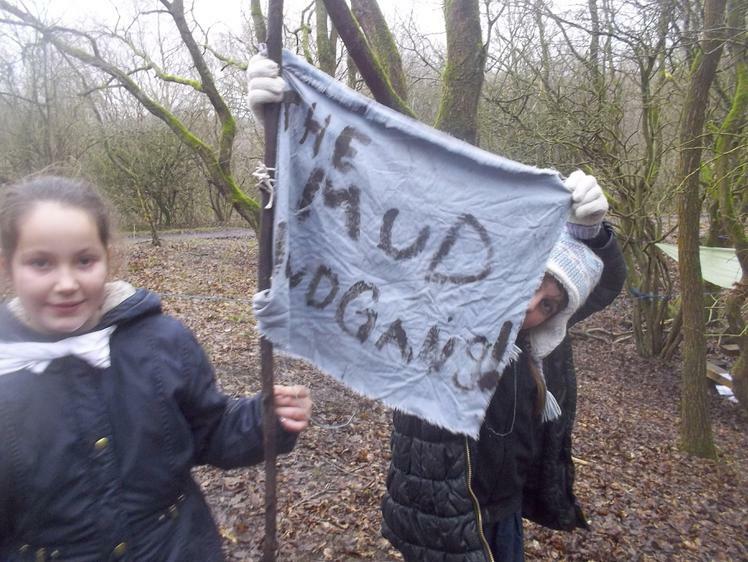 : if so they will soon be added to the following. 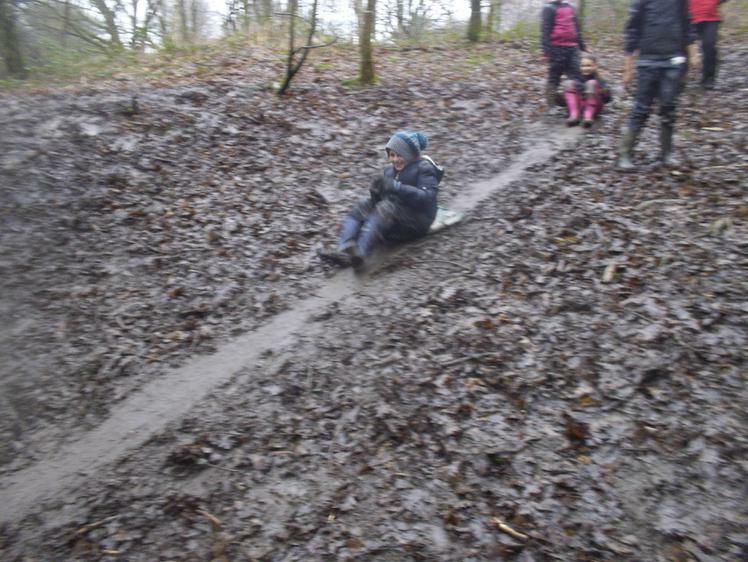 So many activities today, I'm bound to forget something. 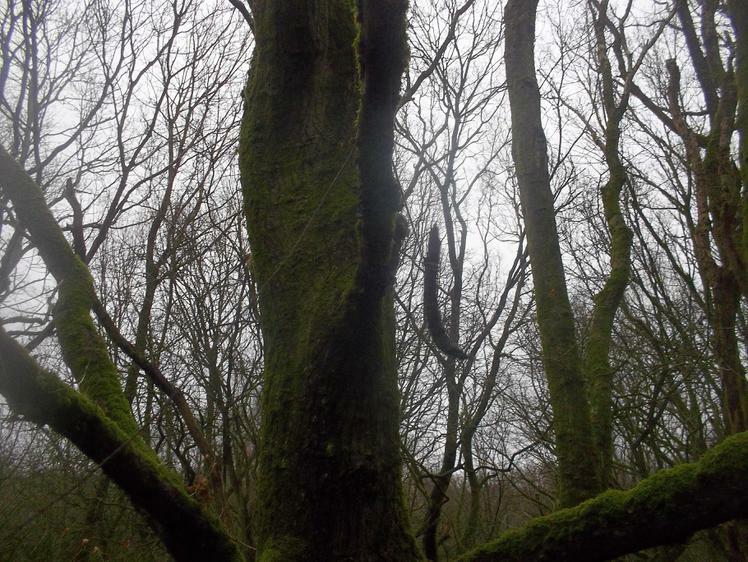 Again the winter sun was hiding behind thick cloud. 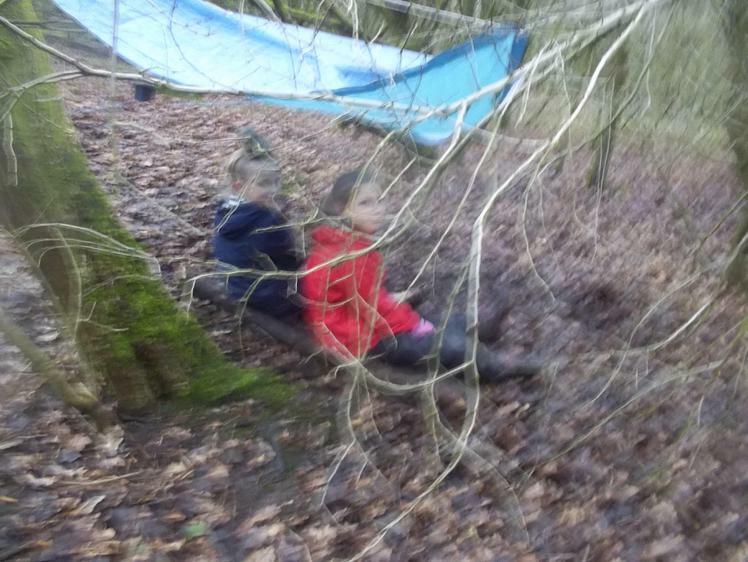 Today there was a breeze, and when the children had gone, it could be heard in the trees. 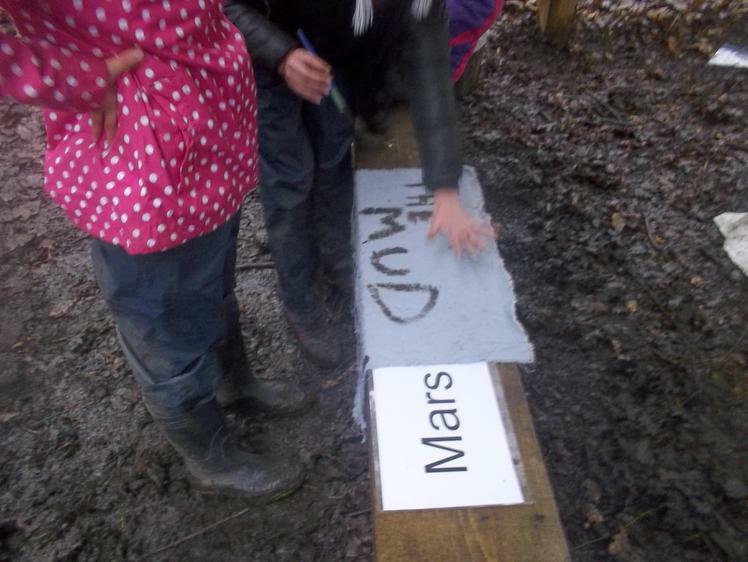 On the space theme, we considered how many astronomical units(AU) the 9 planets were away from the sun. 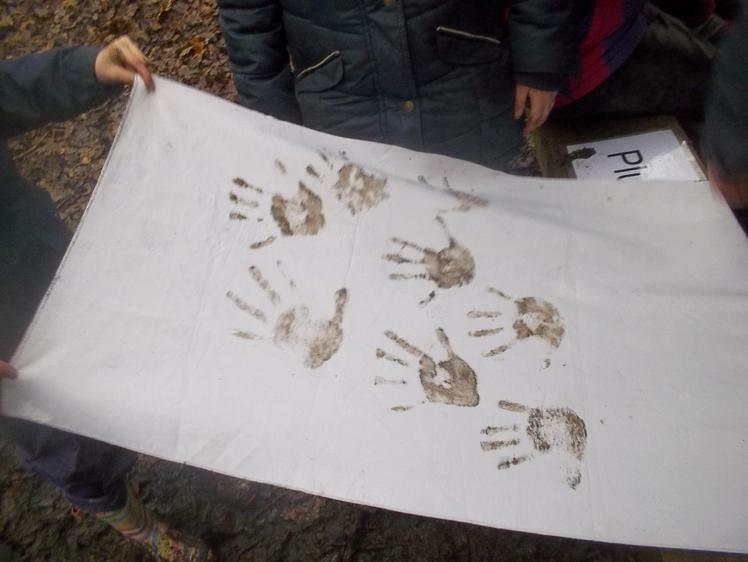 Each group was given the name of a planet, and a chart showing various numerical data relating to the planets of our solar system. 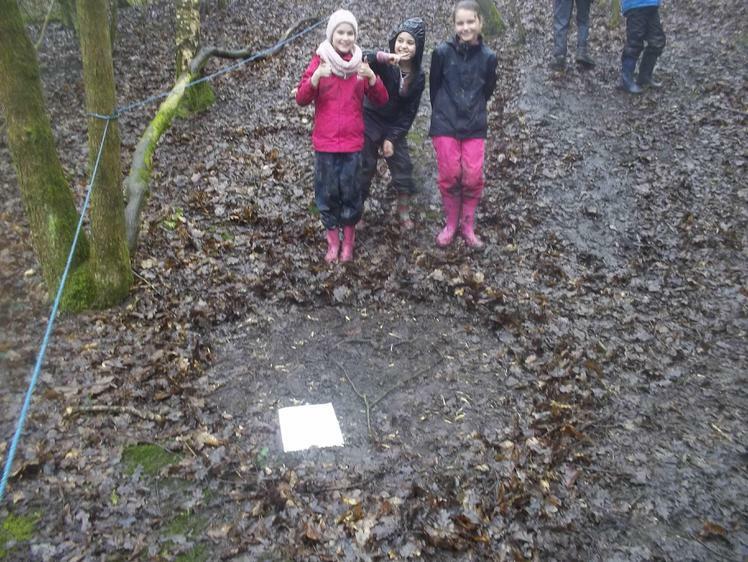 Next we made a model by lining up each planet (sign or group) in relative distances away from the sun (a yellow football)- each AU being represented in paces. 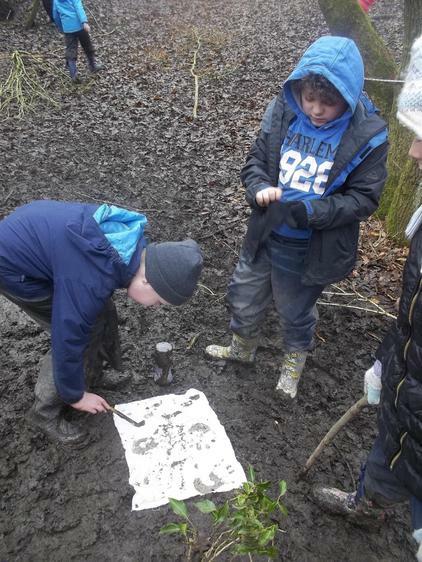 The children were also challenged to find natural objects in the relative sizes of the planets. 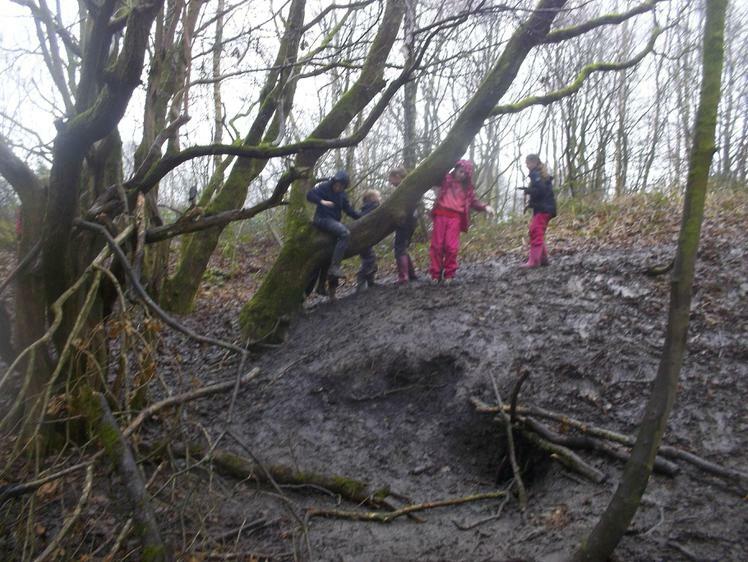 Earth is tiny compared to Jupiter! 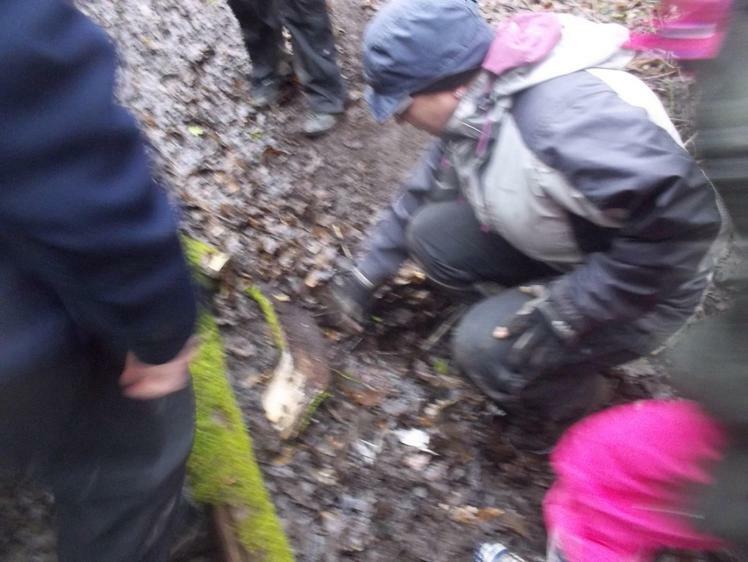 The photos show a variety of activities that the children carried out. 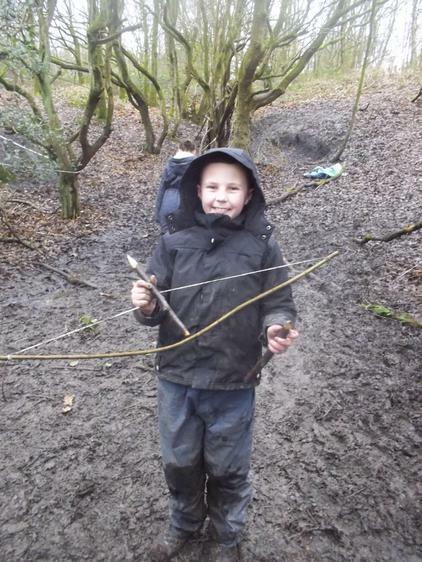 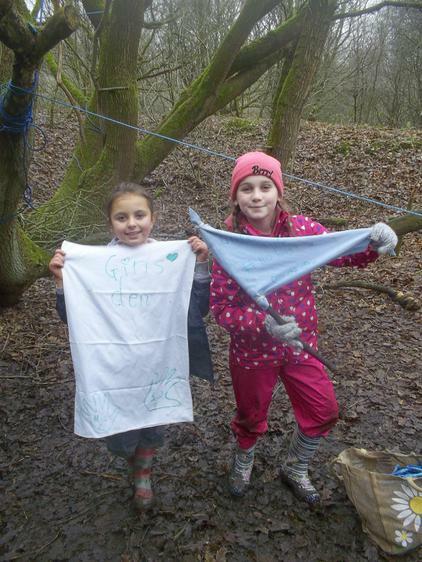 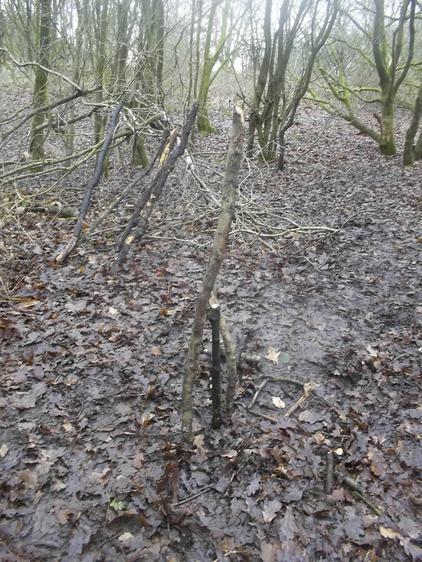 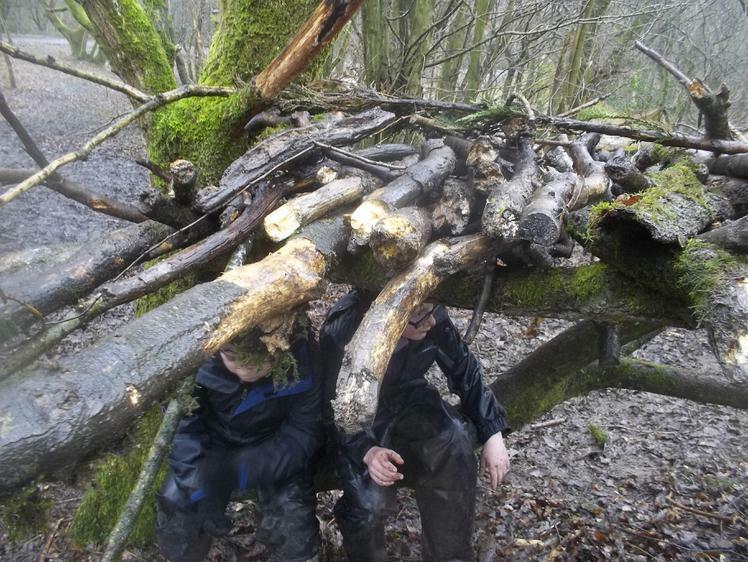 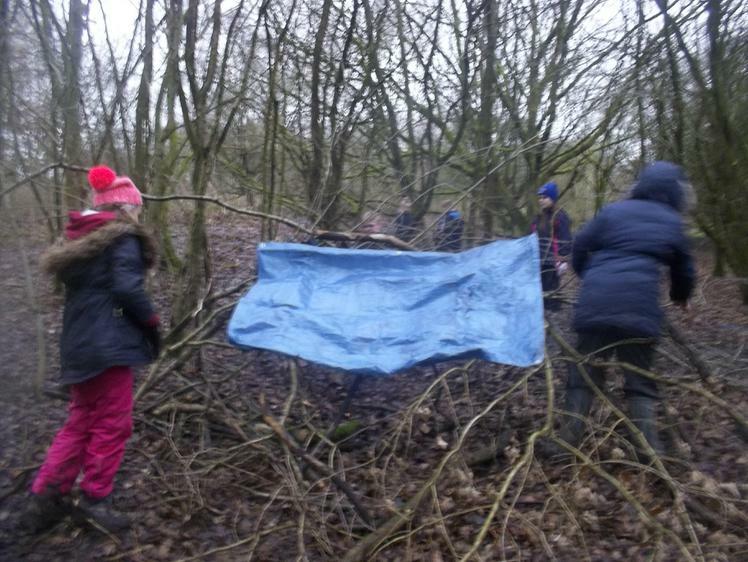 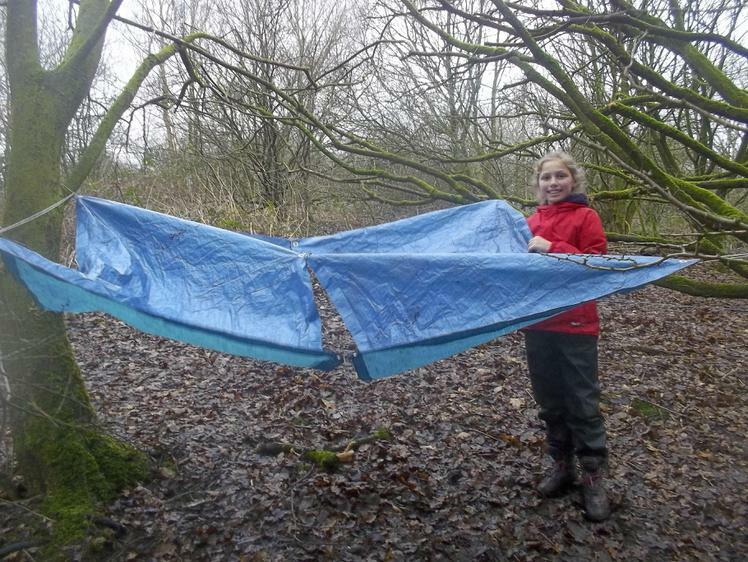 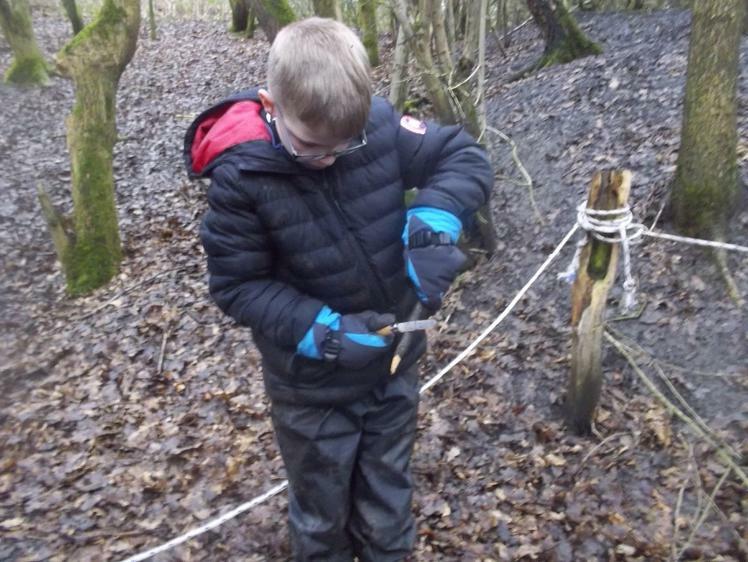 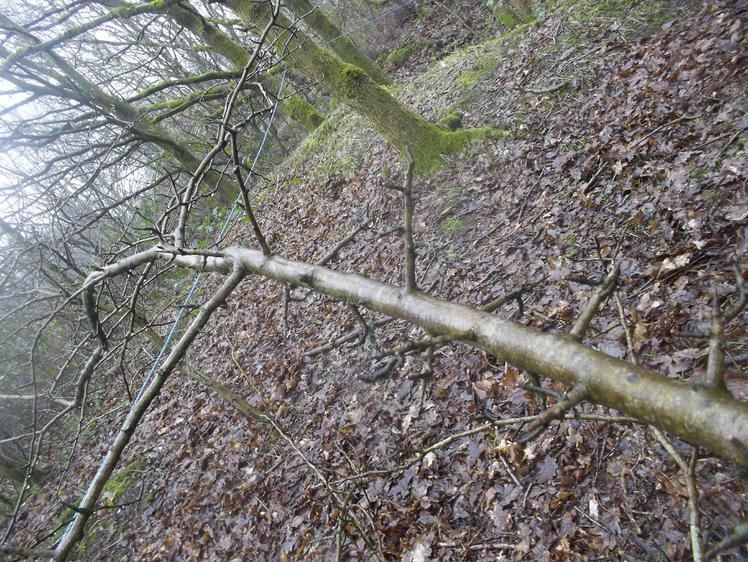 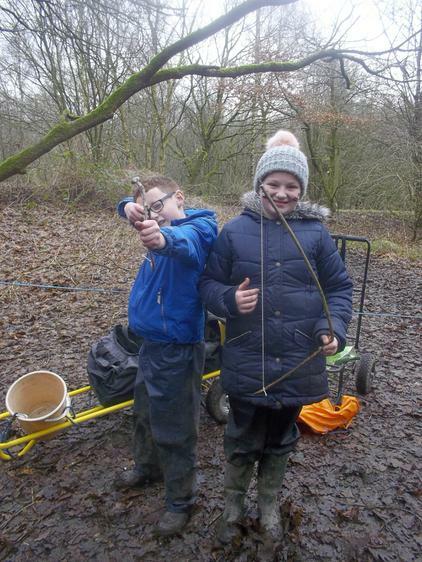 Dens, and bows and arrows are always popular, and present a good opportunity to improve knots, throwing, problem solving, whittling and penknife skills. 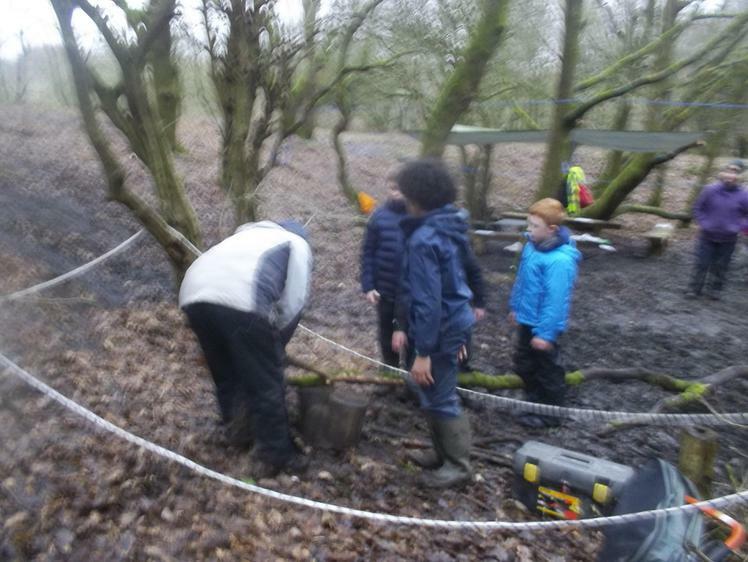 One group was keen to move a long bough towards the tool area, so a piece could be sawn off. 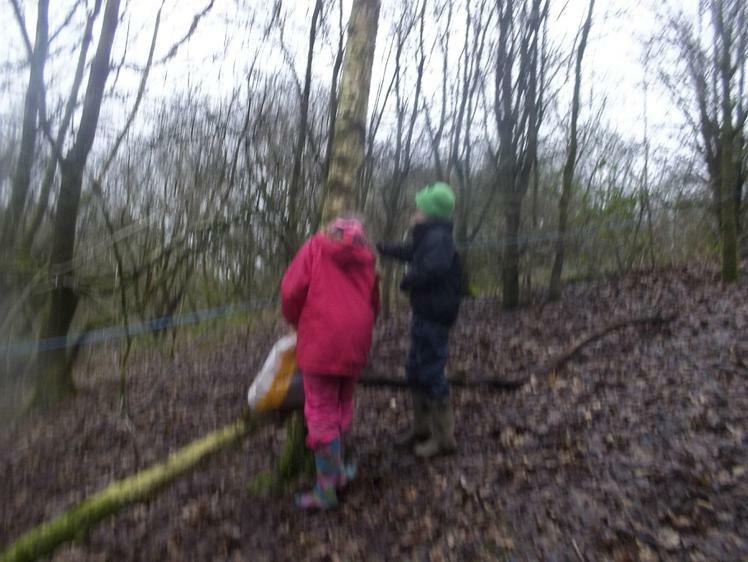 This was potentially dangerous, but the children were really sensible and learned to move it safely as a responsible team considering the others around them. 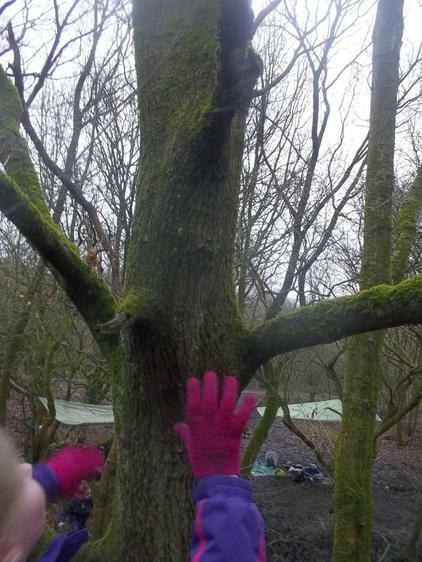 We talked about how to identify trees in winter, when most have lost their leaves. 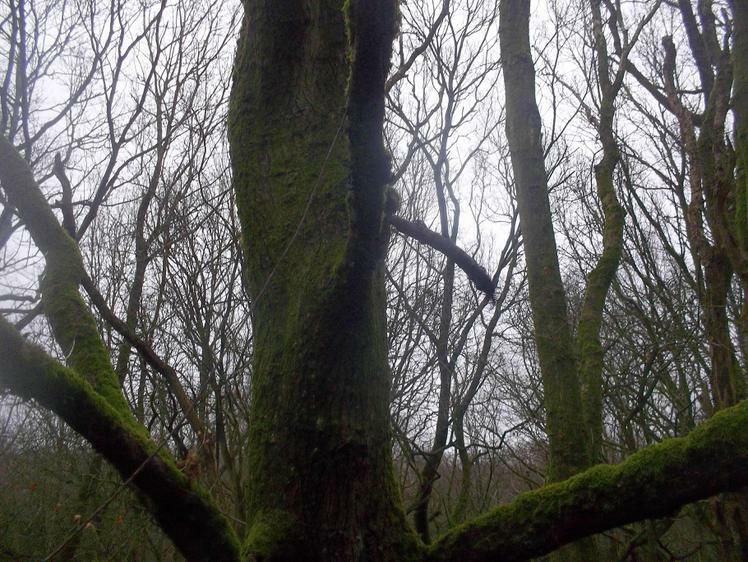 The bark colour, texture, and style is particular to each species. 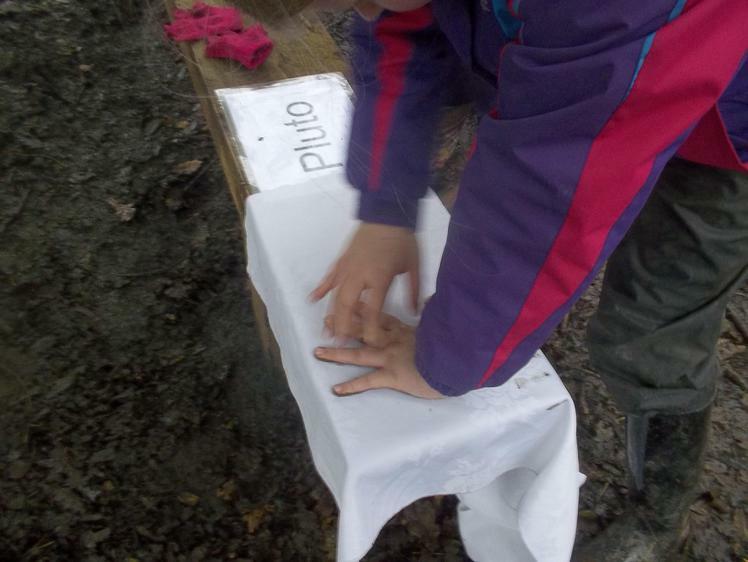 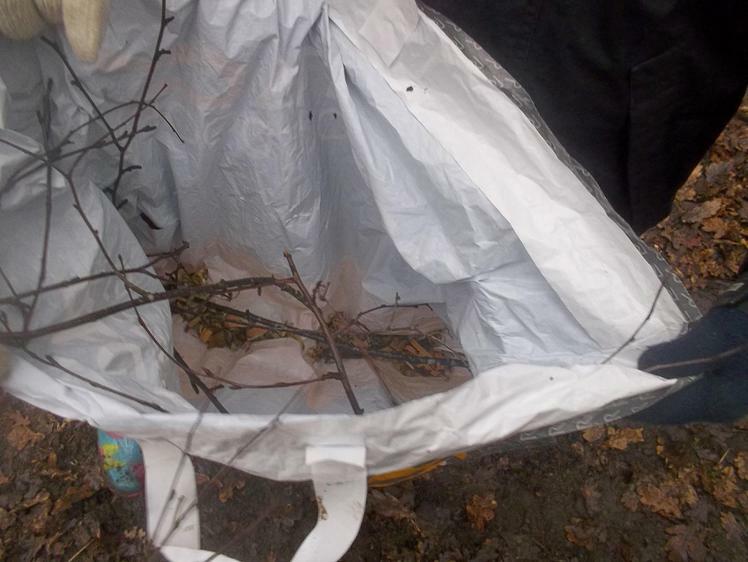 Afew children did bark rubbings and some peeled silver birch bark, as it makes an excellent kindling when dried. 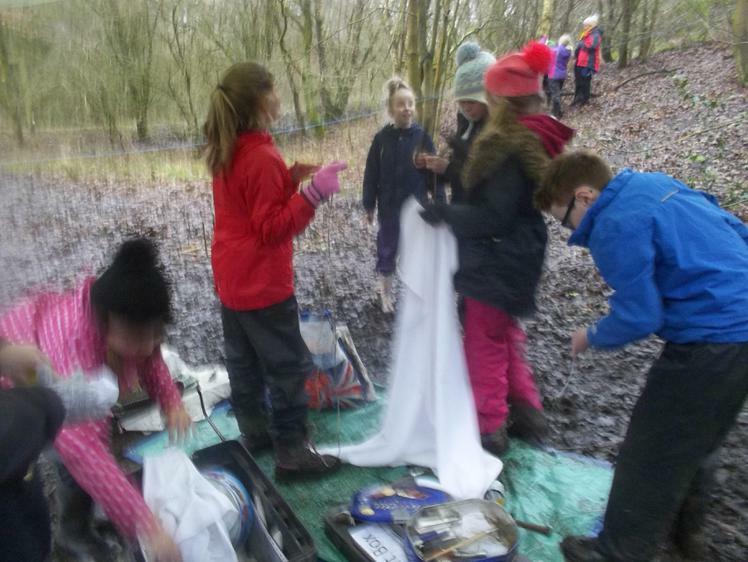 Next week we hope to have a fire and this will prove useful. 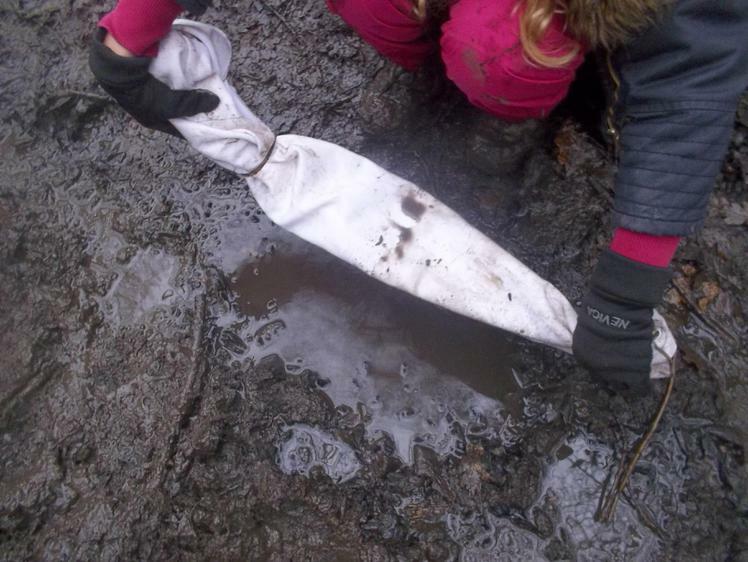 Children explored the properties of cloth, noticing that some of it was waterproof on first contact with puddles, and gradually it began to absorb the water. 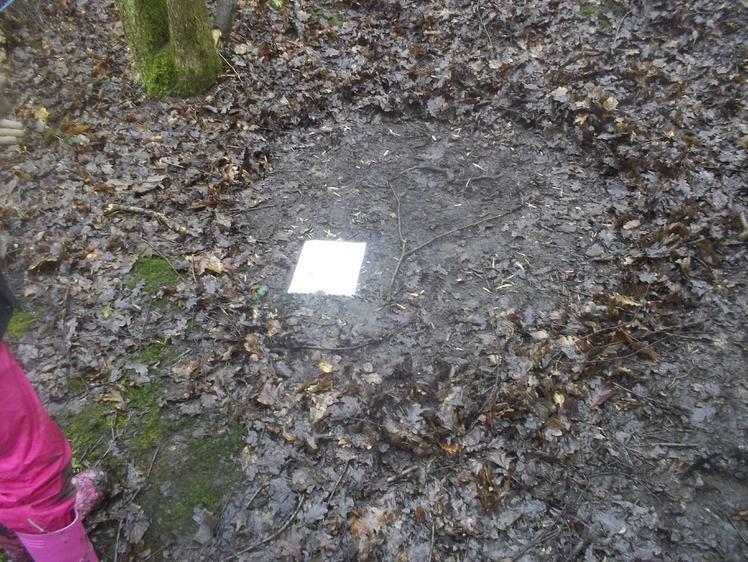 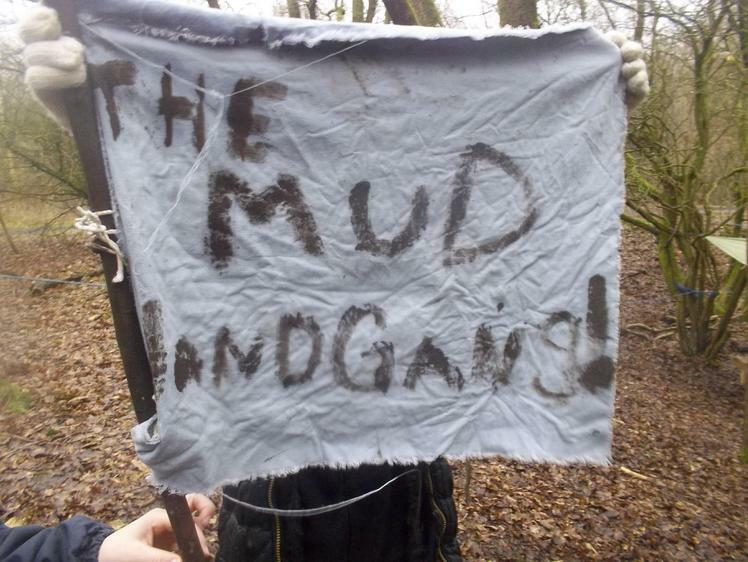 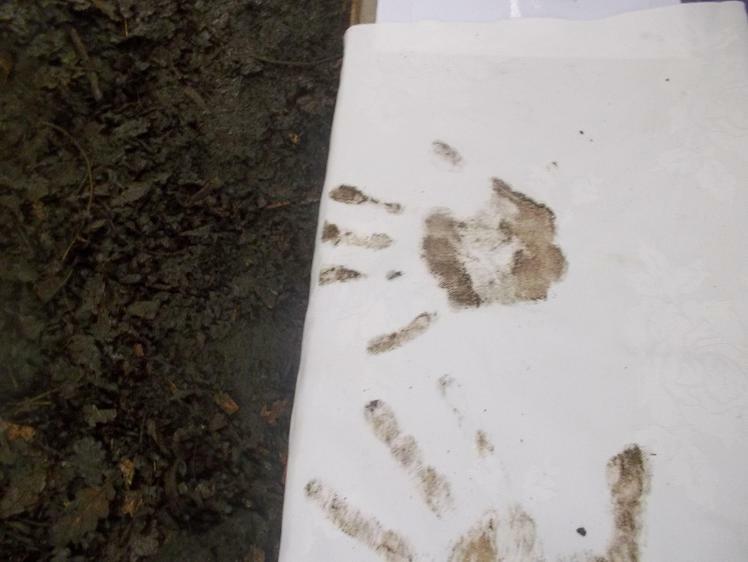 Mud was used as a paint, and flags and songs were created to identify friendship groups and dens made. 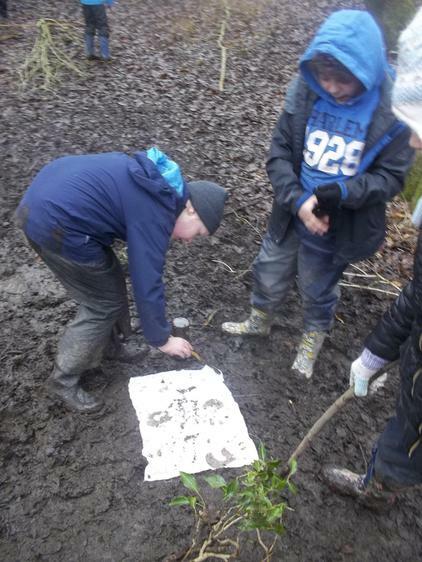 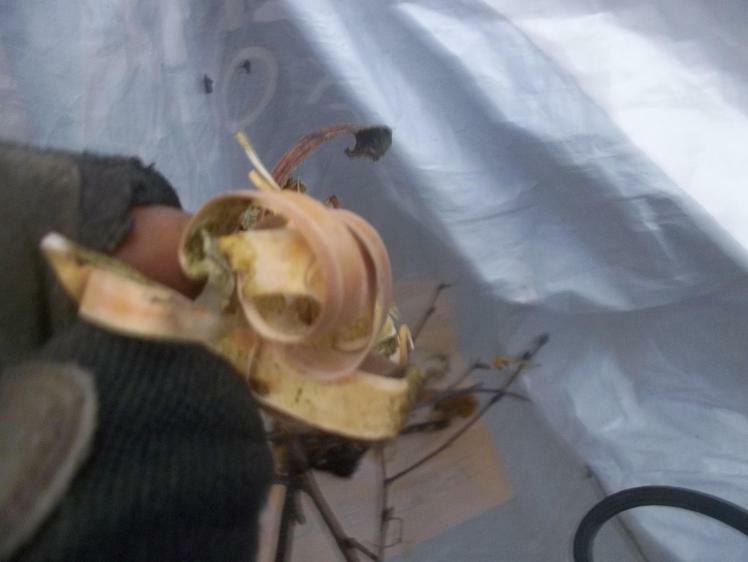 On moving the bough bark fell off revealing a home for invertebrates-we identified woodlice, centipedes, millipedes, worms and slugs all sharing the same piece of bark. 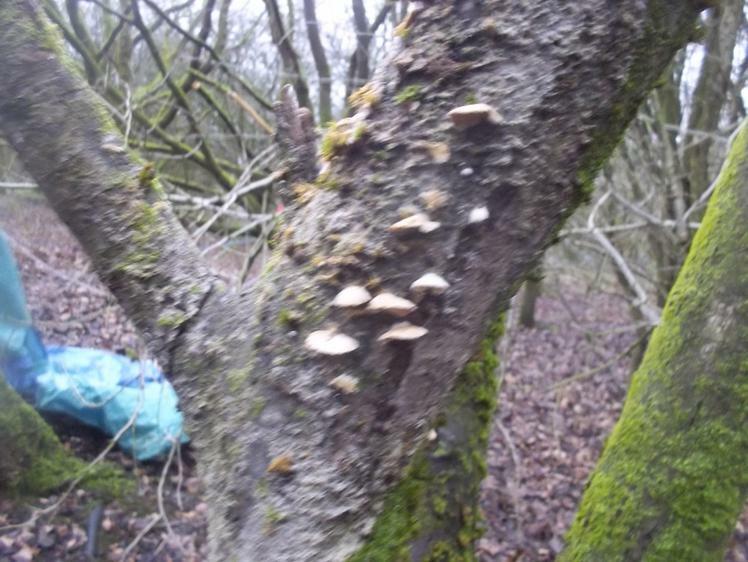 Fungus was spotted including jelly types, puffballs and those in the mushroom shape-some on the ground, some on living trees and some on broken off branches.